This EMBRYO is another of the auctions in my Provence suite. 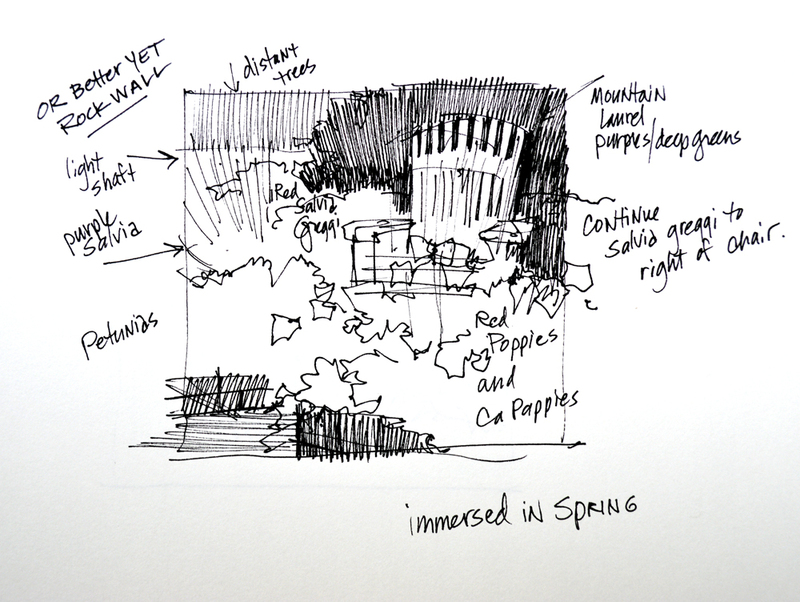 Planning started out with the small thumbnail sketch at the top. My original idea didn’t quite do it for me so I made another drawing below the first. 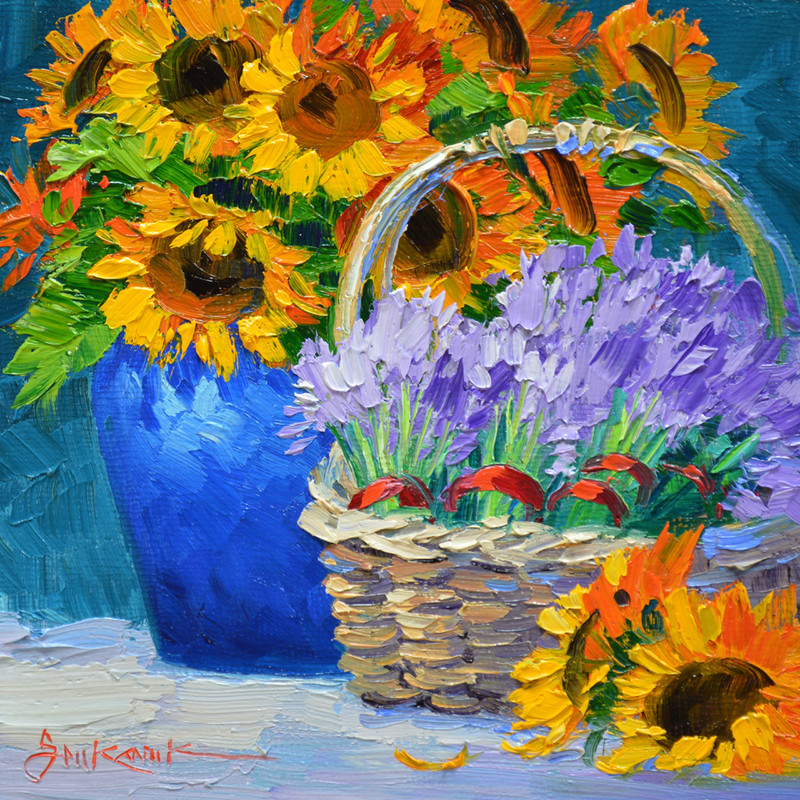 I like the basket of Lavender nestled in between the pot of Sunflowers and the ones on the table in the second composition much, much better. CLICK HERE to go directly to the auctions. 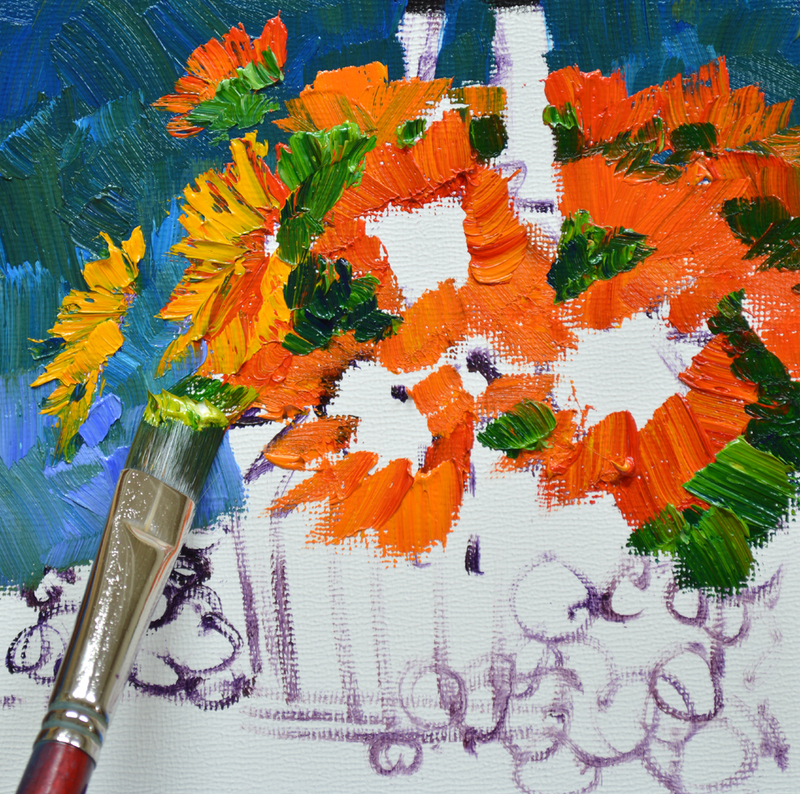 So…..let’s get started at the easel. 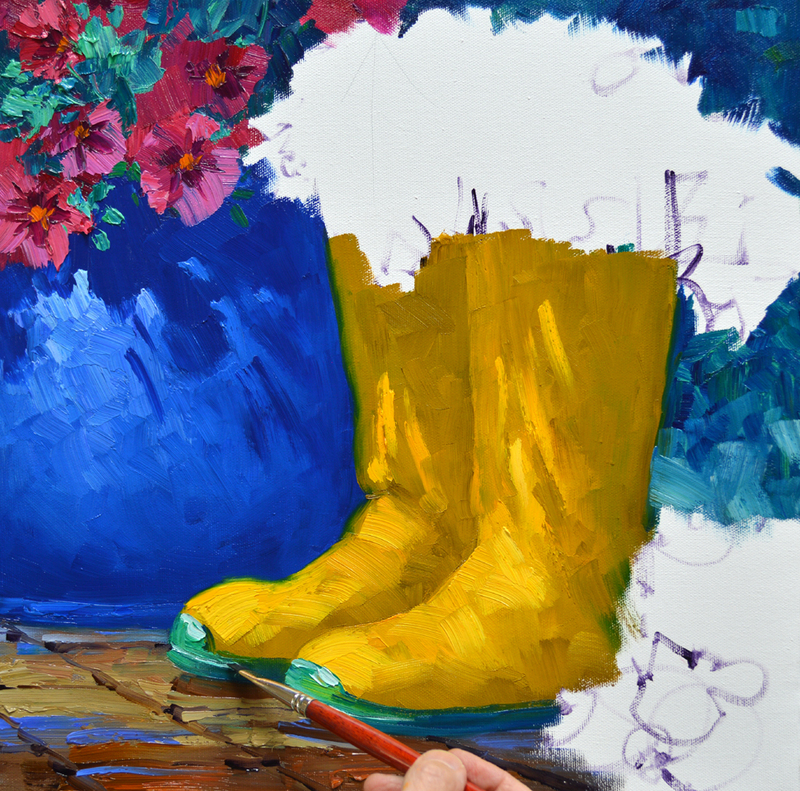 As usual the basic outline is drawn up on the canvas with a brush dipped in a thin oil wash. Then the background is painted around the main elements. Painting the basket is fun. 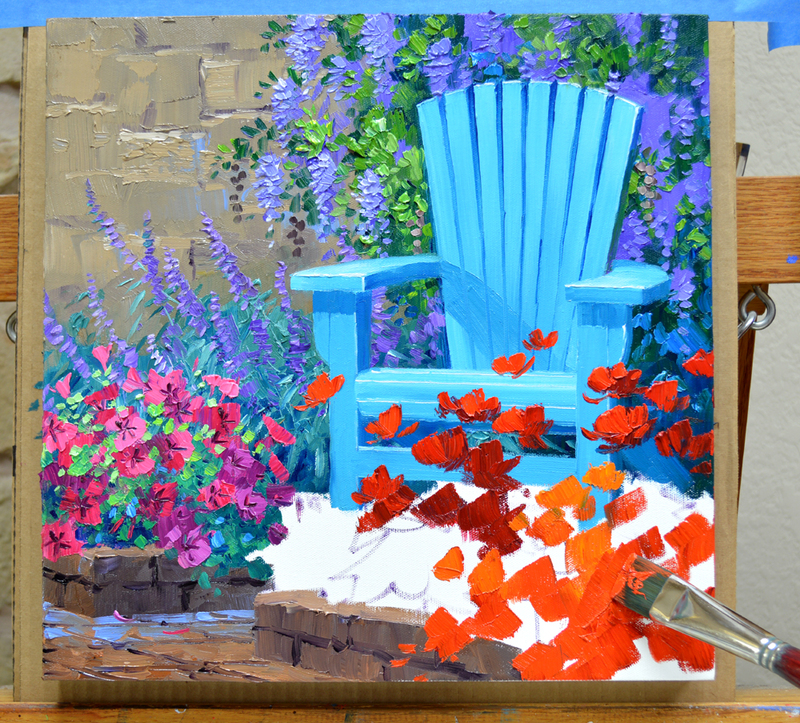 The entire shape is blocked in first with a dark shade of Ultramarine Blue + Cadmium Orange + MUD (Ultramarine Blue + Alizarin Crimson) + White. I come back with lighter shades of the same mix to indicate the woven sides and rim of the basket. 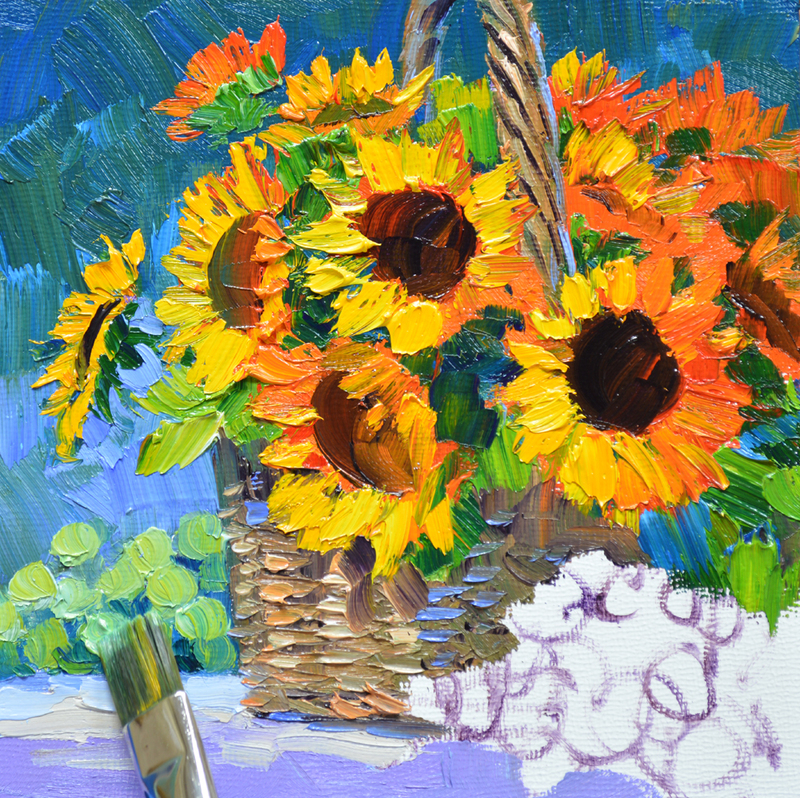 The mass of yellows, golds and reds of the Sunflowers is now painted. 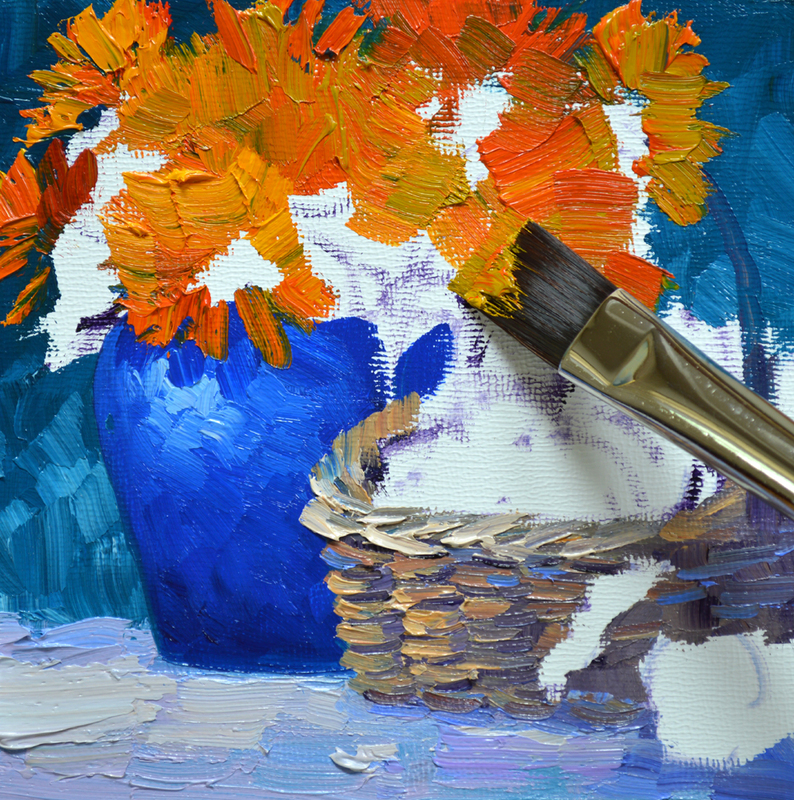 I let the various colors jumble together to give the flowers extra depth and texture. You can enlarge any of the pictures by clicking on the image. Going to the outdoor markets in Provence is so much fun; Sunflowers and Lavender are everywhere. When you walk close to the displays of Lavender the aroma is delightful. Jack and I think this wonderful scent should be called the Fragrance of Provence. Let this little EMBRYO bring drifts of that relaxing fragrance to float gently through your home. Fragrance of Provence is one in a suite of four Provence themed EMBRYOS. 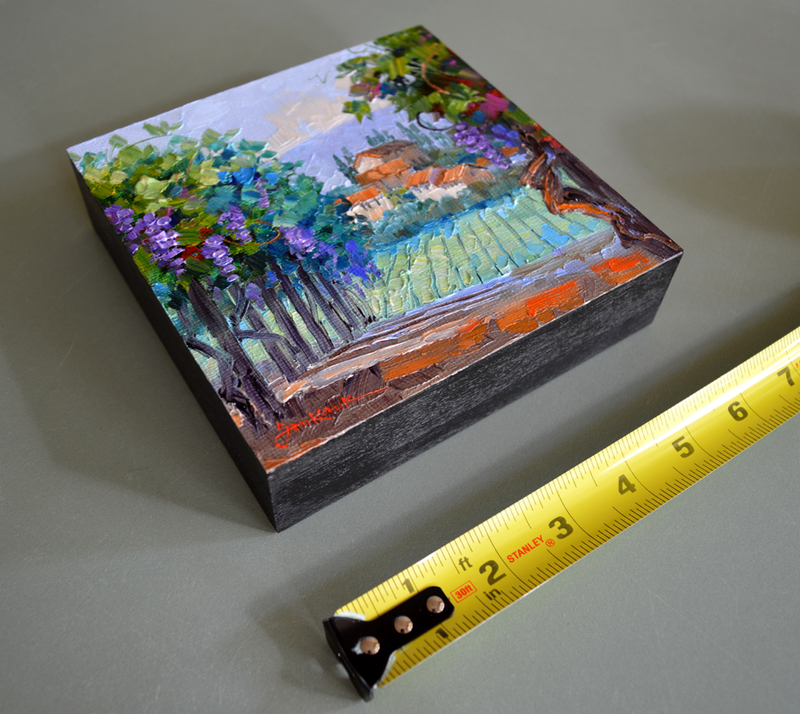 They measure 6″ x 6″ and you don’t have to worry about doing any framing, the sides are finished and they’re ready to hang. Here’s a photo of the grouping of 4 Embryos so you can see how they look. Bring the beauty of Provence to your home. 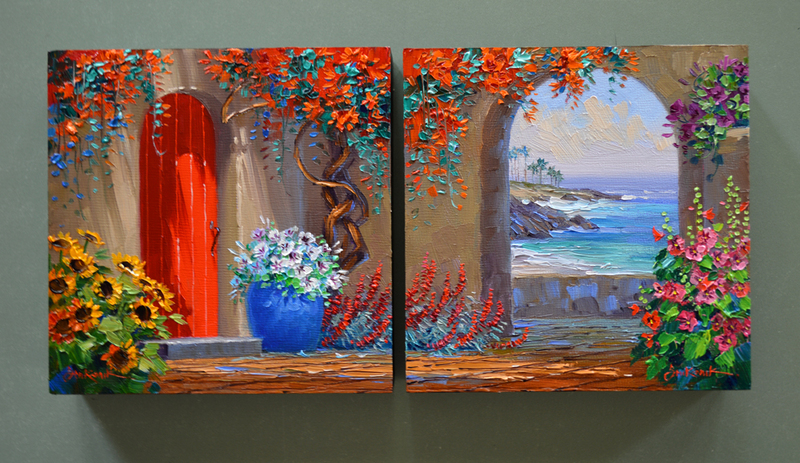 The auctions are staggered 7 minutes apart so you can win all four Original Oil Paintings to hang on your wall. AND…..If you win the ENTIRE Suite of Provence EMBRYOS we will give you FREE SHIPPING! CLICK HERE to go directly to all four auctions. 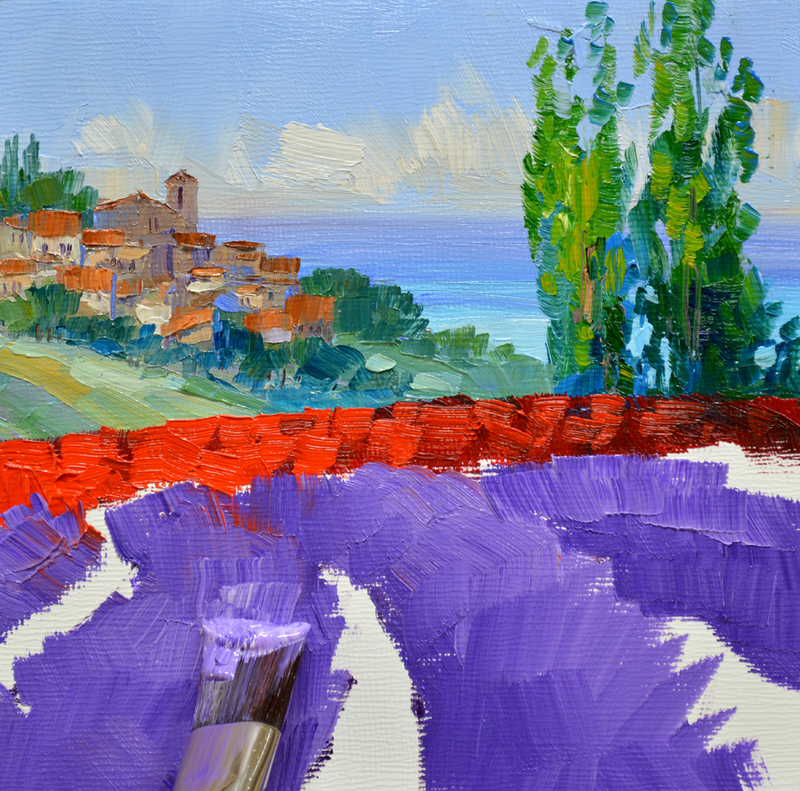 Lavender fields in Provence, aren’t they wonderful? I made the sketch at the left many, many years ago and this seems to be the perfect time to bring it out. 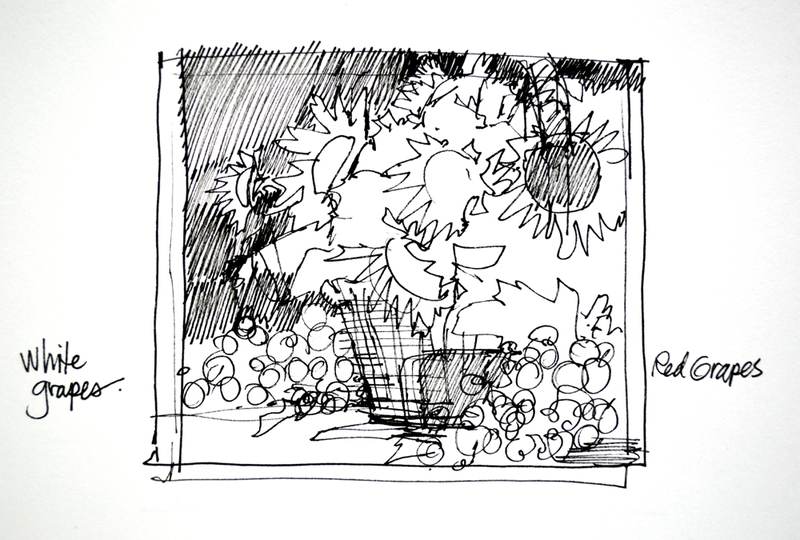 I’ve redrawn the composition to fit the square format of the 6″ x 6″ EMBRYO. You can click on any of the pictures to see them larger. 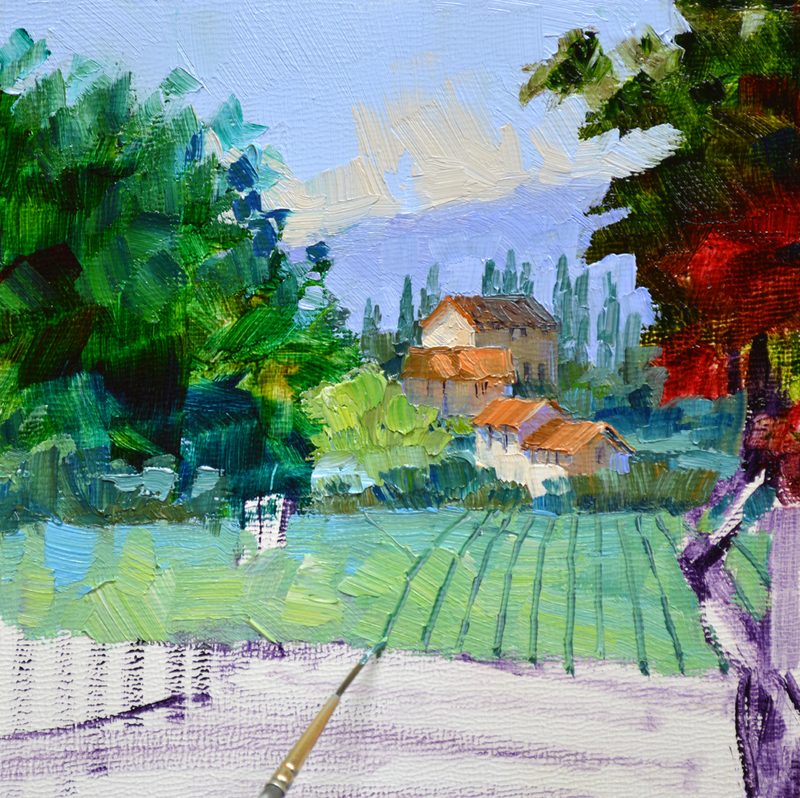 This week I’ve painted a suite of four EMBRYOS, all of Provence, for our eBay auctions. To go directly to the auctions CLICK HERE. 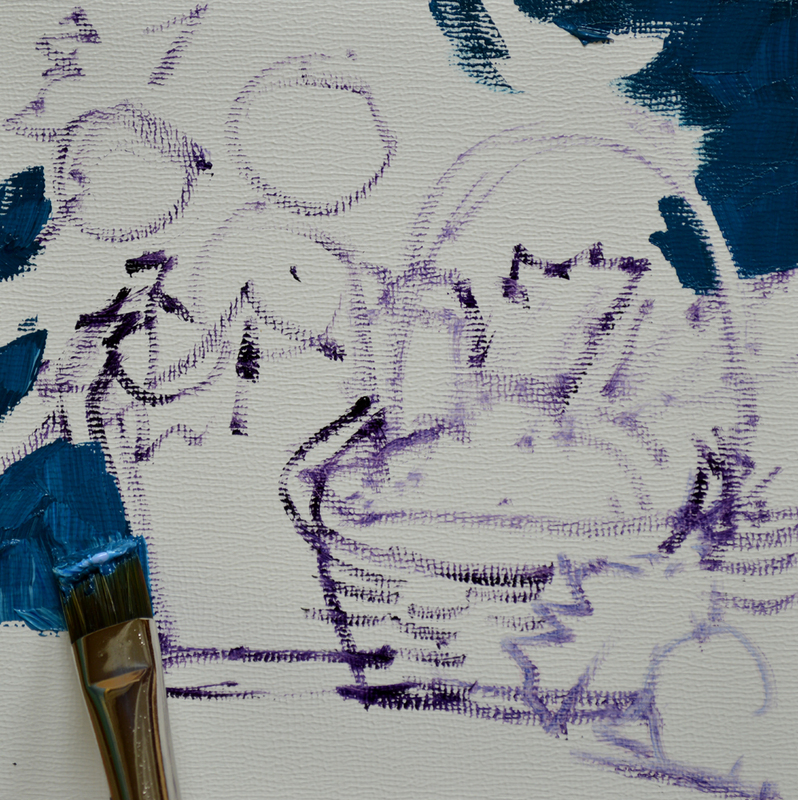 The basic design was first drawn on the canvas in a thin wash of MUD (Ultramarine Blue + Alizarin Crimson) + Liquin. Then the sky is painted before moving forward to the brilliant water of the Cote d’Azur. I was happily painting away when Jack asked, “Have you taken a picture lately?” OPPS! It was so fun working on the distant hilltop village that I totally forgot to take a step-by-step photo. Here I’m blocking in the sweeping rows of Lavender with Dioxazine Purple + White. There is nothing like standing in a field of lavender in Provence on a sunny day. Listen closely, can you hear the bees buzzing around, collecting nectar for their lavender honey? 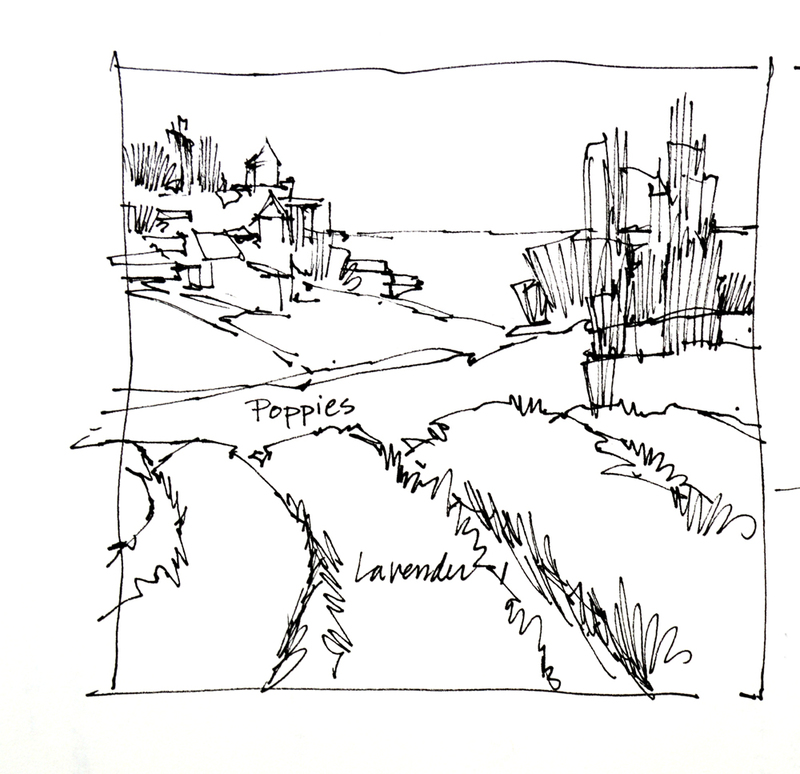 The Ribbon of Scarlet poppies in the distance is a brilliant counterpoint to the soft purple rows. 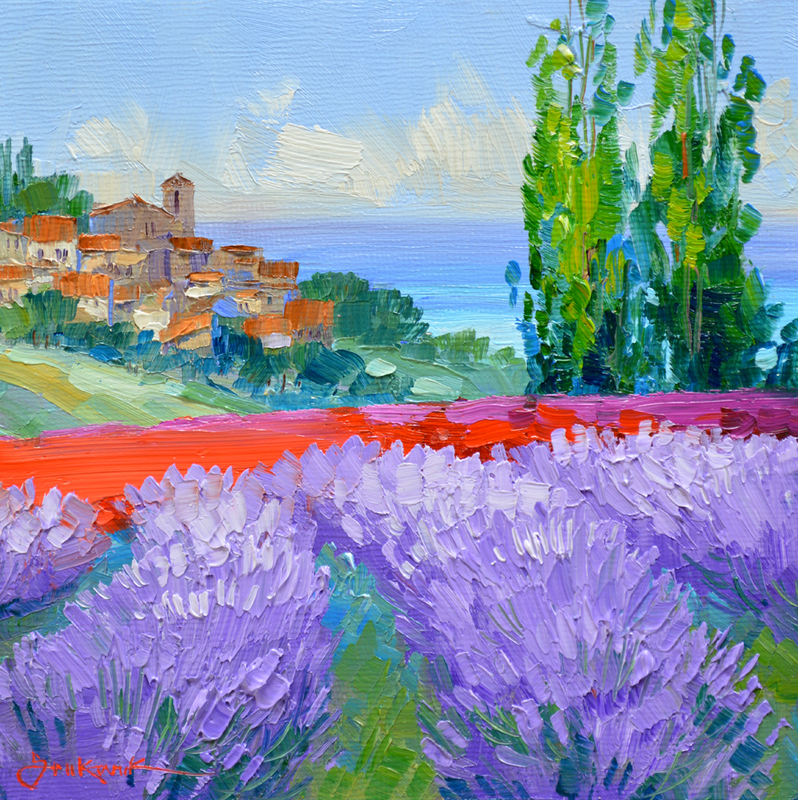 Let the fresh ocean breeze deliver a touch of Provence every time you look at this painting on your wall. My EMBRYOS retail in our galleries for $300. However we are starting the bidding at 1 cent. That’s right, ONE PENNY! 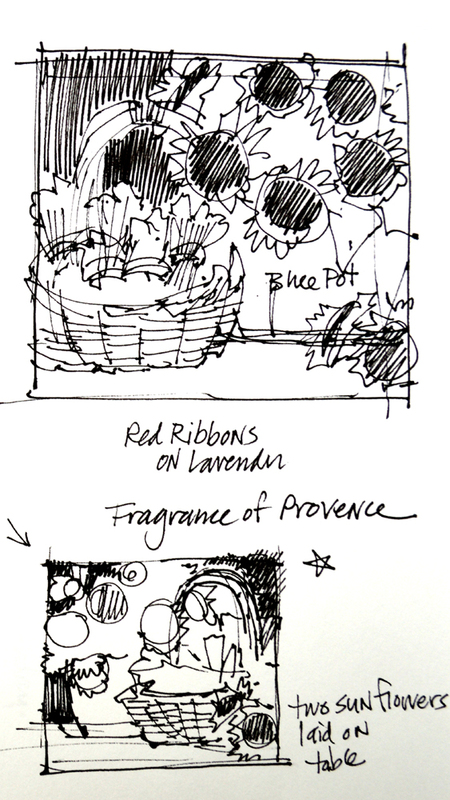 Ribbon of Scarlet is one in a suite of four Provence themed EMBRYOS. 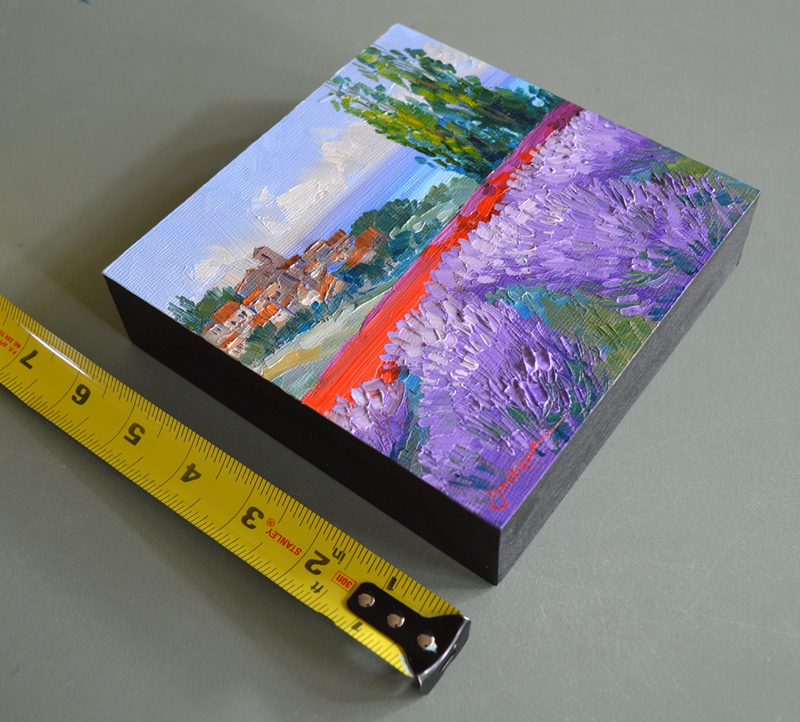 They measure 6″ x 6″ and you don’t have to worry about doing any framing, the sides are finished and they’re ready to hang. I’ve included a photo of the grouping of 4 Embryos so you can see how they look. Bring the beauty of Provence to your home. The auctions are staggered 7 minutes apart so you can win all four Original Oil Paintings to hang on your wall. AND…..If you win the ENTIRE Suite of Provence EMBRYOS we will give you FREE SHIPPING! Beautiful Spring! The earth wakes up and flowers come alive. 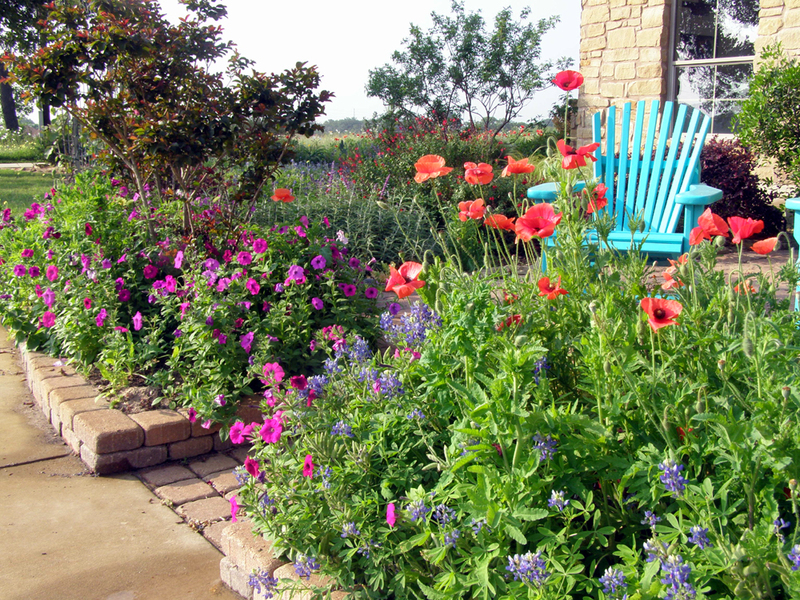 Our front patio overflows with Red Corn Poppies, Bluebonnets, Laura Bush Petunias, Mexican Bush Sage, Salvia Greggi and fragrant Mountain Laurel. A quick sketch is made to compose my idea. 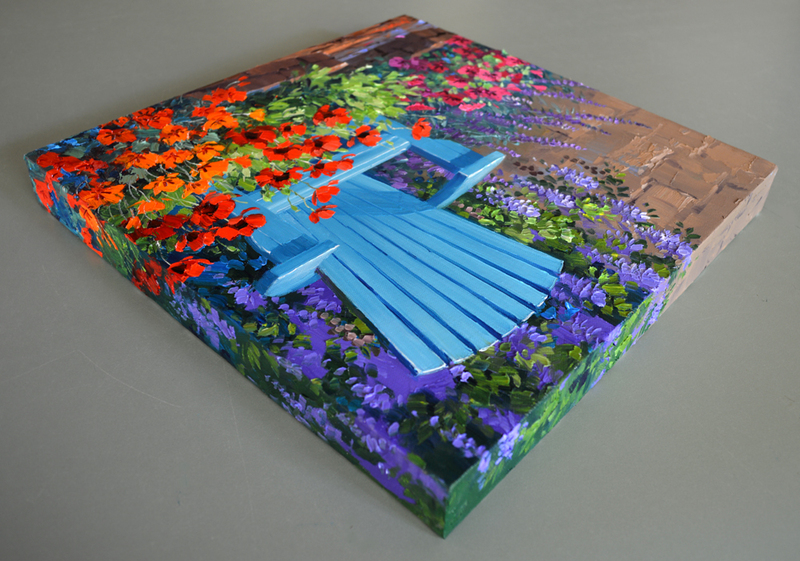 I decided to move some California Poppies from another area to the foreground of this piece. You may click on any of the images to view them larger. The basic plan is drawn up on the canvas in a thin oil wash. 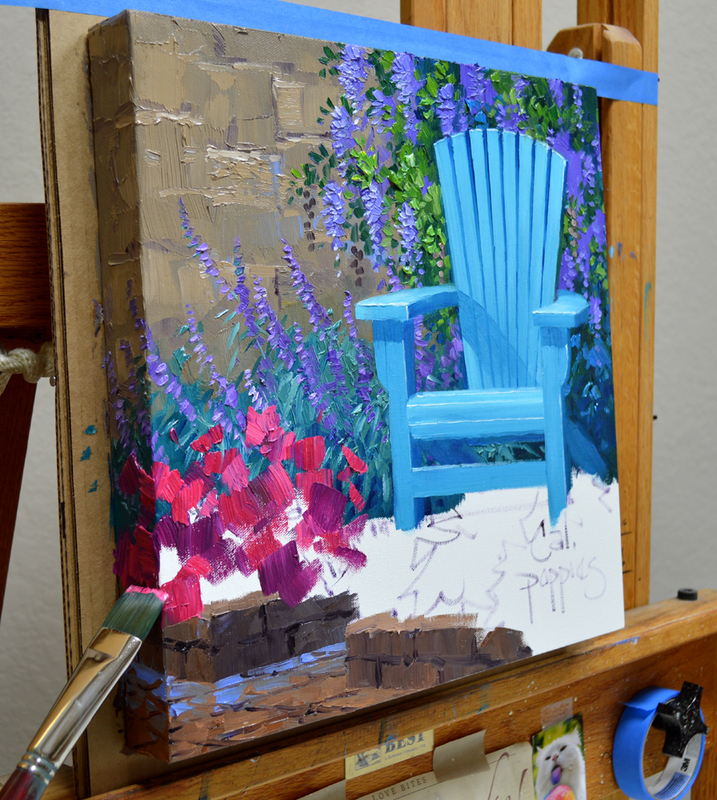 I extend the rock wall to fill the entire left corner because the adobe color will make a nice neutral backdrop for the brilliant chair and flowers. 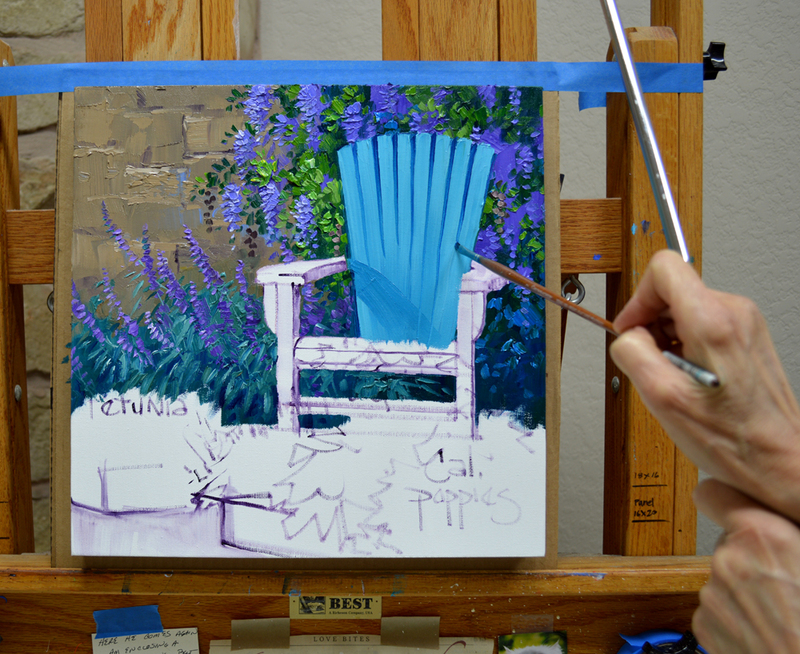 Then I begin painting the Mountain Laurel, Flowers First, Leaves Last. 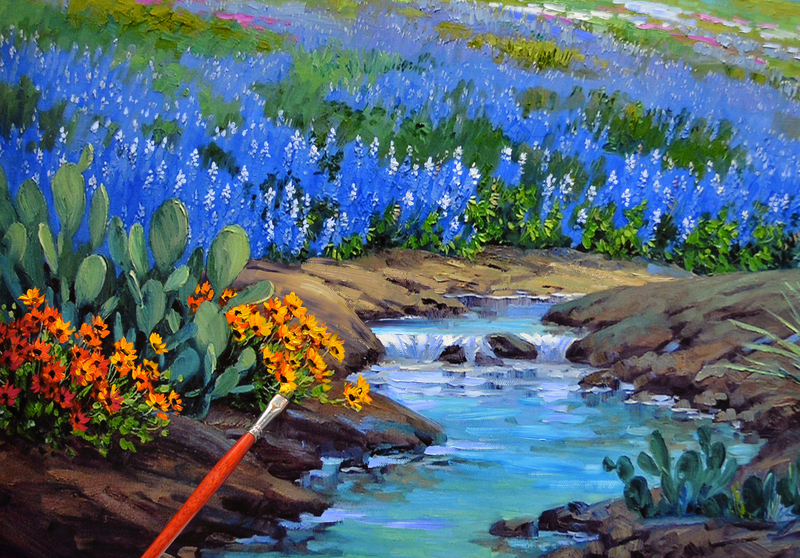 I’ve decided not to include the Red Salvia Greggi, instead filling the background with the purples of the Mountain Laurel and Mexican Bush Sage. 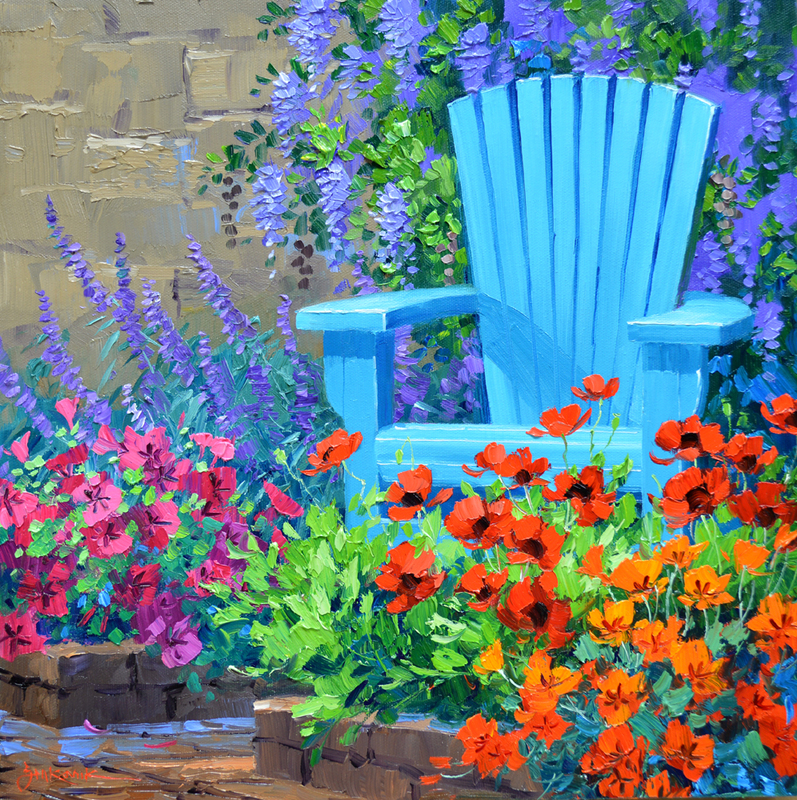 These cool colors will drop back behind the chair and the warmer, more intense flowers in the foreground. The Petunias are blocked in with mixes of Magenta + Permanent Rose + White and Permanent Rose + White. Working near the edges I continue the design onto the sides. The flowers of the Red Corn Poppies are added, then California Poppies bring a bright blast of warmth to the foreground. I love sitting in this little courtyard totally Immersed in Spring, enveloped by the fragrance of the Petunias and Mountain Laurels. 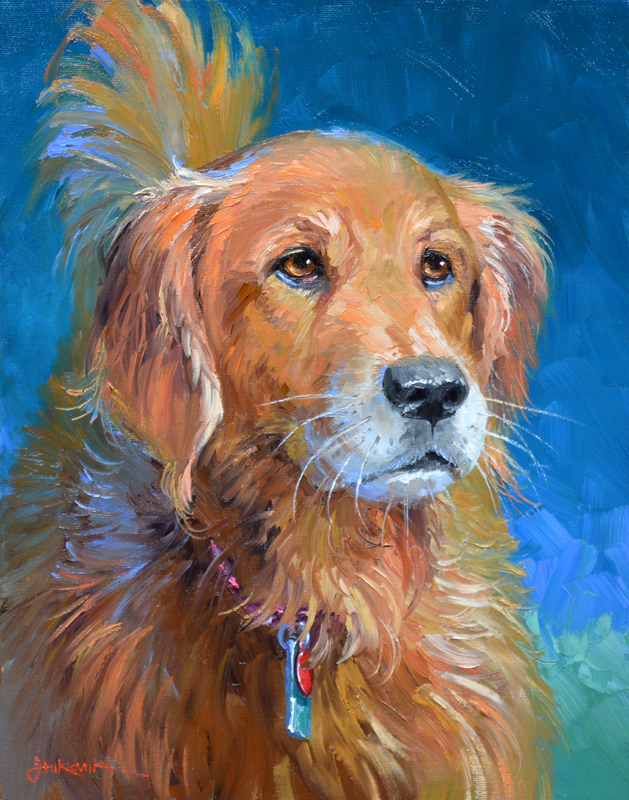 First of all, Jack’s newest article has just been published on Fine Art Studio Online. CLICK HERE to read Fueling Passion. The Jewel is the companion piece to Radiant Red. For our auctions on eBay this week I’ve designed these EMBRYOS to hang as a pair. The two placed side-by-side make a complete courtyard scene overlooking the beautiful La Jolla coastline. I sketch them up together to make sure the composition flows from one piece to the other. 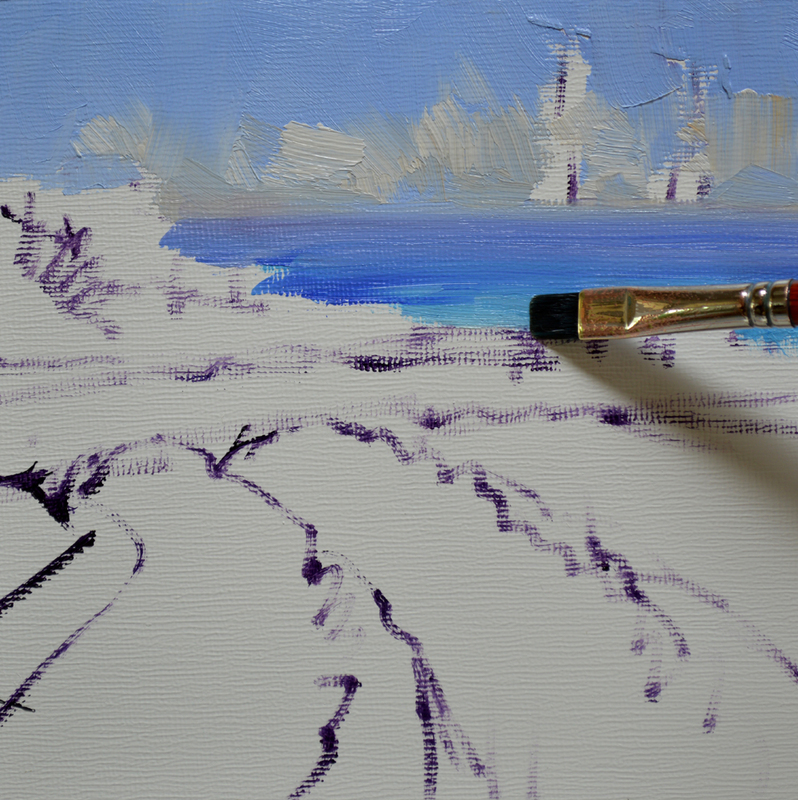 Having sketched up my plan in a thin oil wash, I begin painting with the sky. Working forward the distant water and La Jolla bluffs are blocked in. The foreground water is then painted in azure hues made of Pthalo Blue + a tiny bit of Viridian Green + White. Tall, lanky palms finish out the scene of La Jolla. 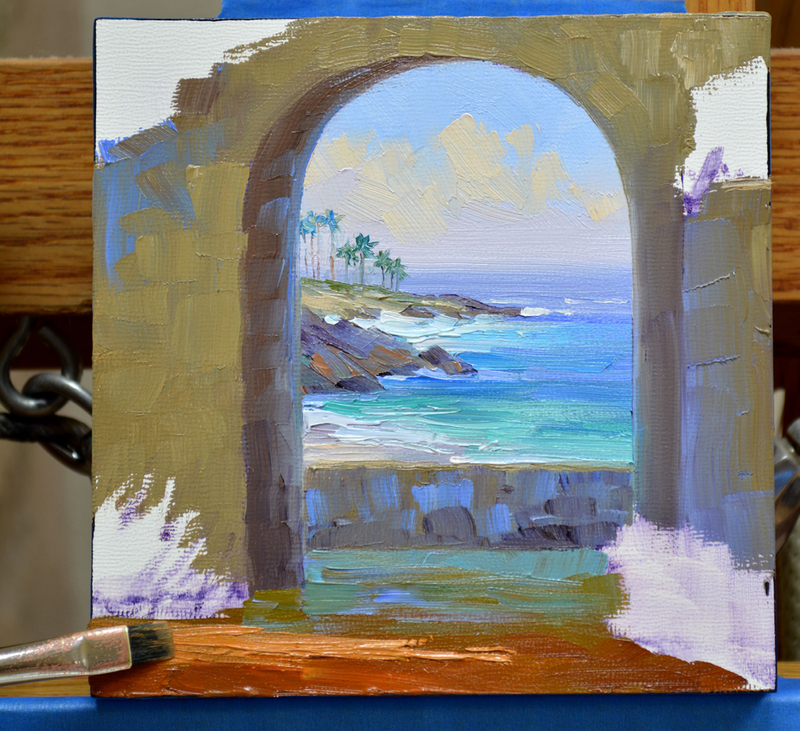 The sunlit scene in the distance is then framed by the dark walls of the archway. I let a ray of sunshine skip across the courtyard floor. 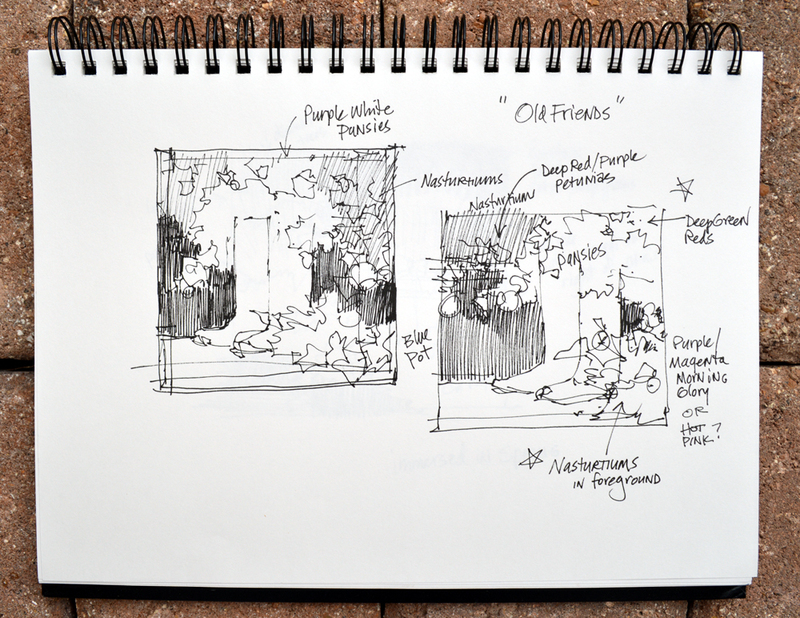 The tendrils of Trumpet Vine sway, to and fro, in the ocean breeze and Red Penstemon nestles at the base of the arch. Please remember, you can click on any of the images to see them larger. La Jolla means “The Jewel”. I can see why, the azure water just glistens in the sun. 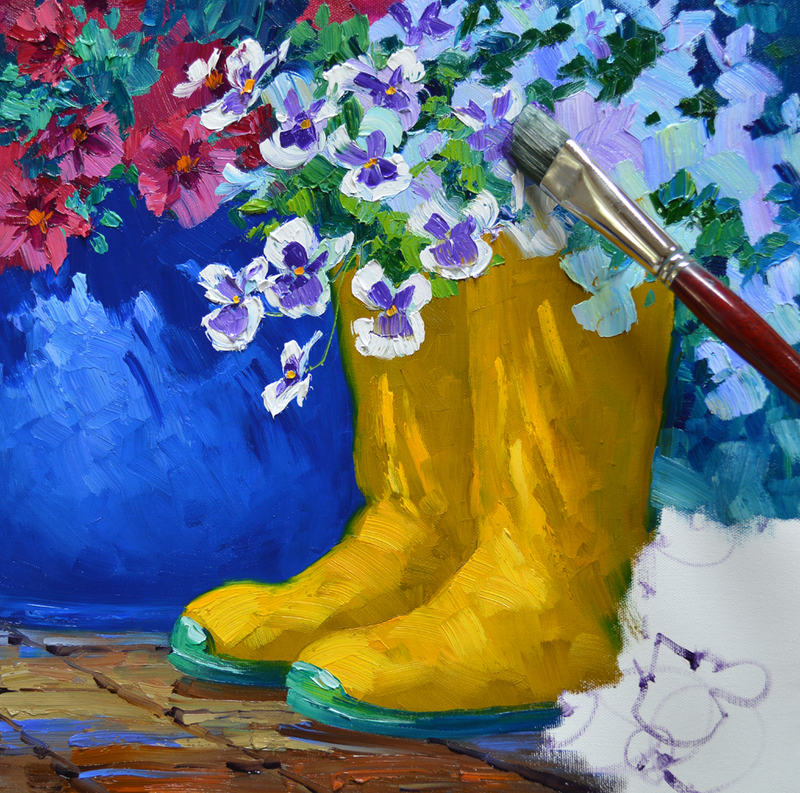 Painting this little gem brings back many warm memories. Wouldn’t you love to be there, walking on the beach with the surf gently tickling your toes? 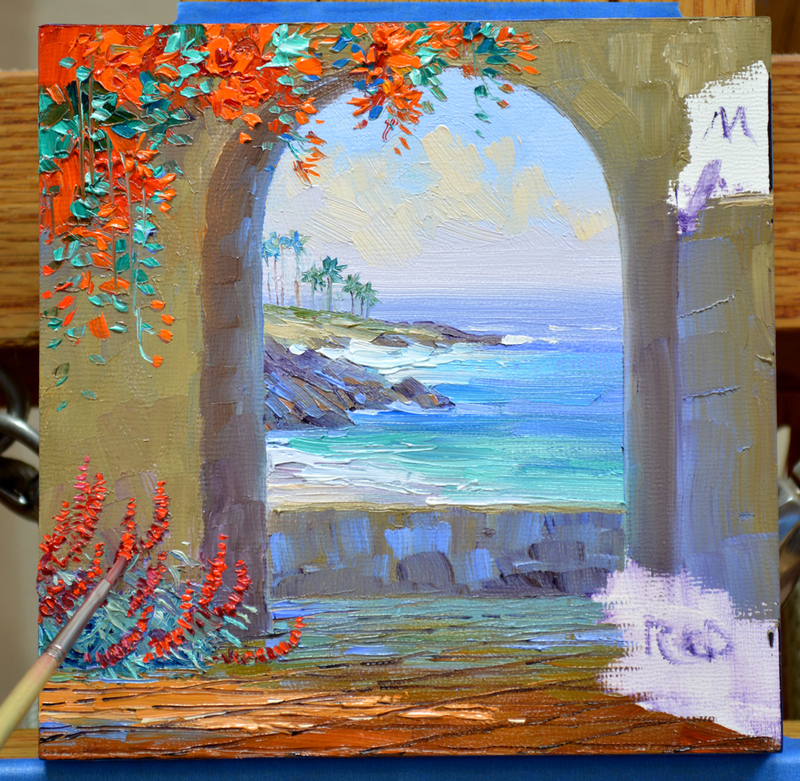 Take a magical trip to La Jolla every time you look at this painting on your wall. My EMBRYOS retail in our galleries for $300. However we are starting the bidding at 1 cent. That’s right, ONE PENNY! Having earned a Master’s degree in Medical Illustration from the Medical College of Georgia, I’ve illustrated 47 major Medical, Anatomy and Surgical Textbooks. In honor of my Medical background these charming baby oil paintings are called EMBRYOS. Jack and I are happy to offer these little 6 inch by 6 inch EMBRYOS to our eBay collectors. They are new, fresh ideas that have yet to be “birthed” into a larger gallery piece. Add a spot of color on your wall with one or several, these collectible EMBRYOS hang nicely in groups. Do you have a gift giving occasion coming up? EMBRYOS make wonderful gifts that will bring smiles for years to come. The Jewel is one of two EMBRYOS designed to hang as a pair, but they can displayed individually. I’ve included a picture of the grouping. Wouldn’t you love to live here? 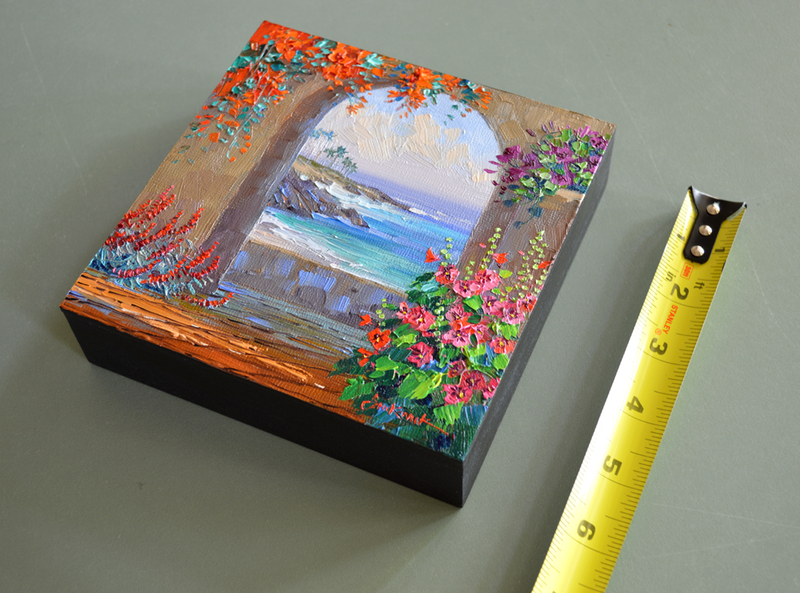 Bring the beauty of La Jolla to your home. The auctions are staggered 7 minutes apart so you can win the two Original Oil Paintings to hang on your wall. AND…..If you win both pieces we will give you FREE SHIPPING! A longtime friend of ours has been battling colon cancer since April 2012. We’re happy to report she is doing well and is cancer free today. 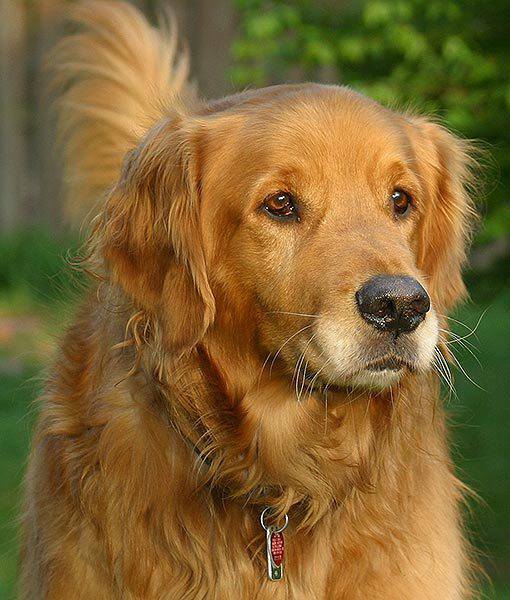 Chipper Dale, Jo’s faithful companion for 14 years was constantly by her side during all of the cancer ups and downs. God gathered Chipper Dale up in his arms and took him to Puppy Heaven this past week. It’s so tough to lose a pet, they are such a part of your soul. Jack suggested I do a painting of him as a surprise for Jo. 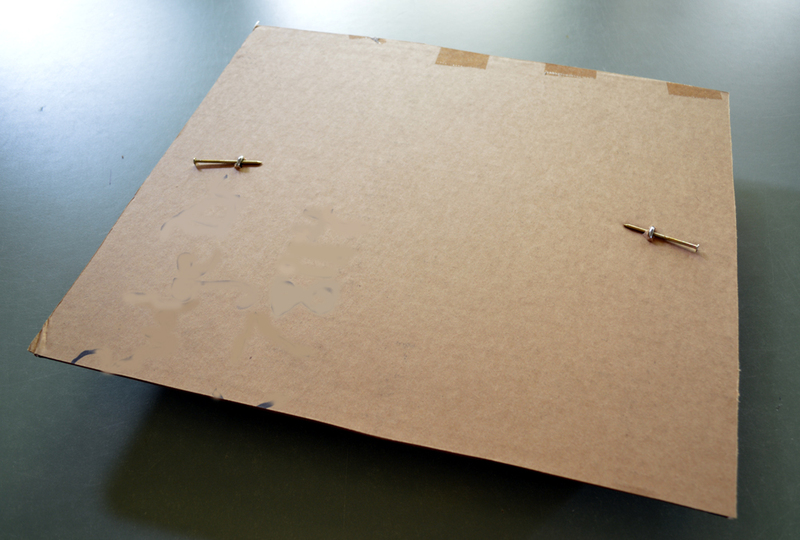 Since we’ll be shipping this while it’s still a bit wet I’m attaching the canvas to cardboard. Two screw eyes are inserted into the stretcher bars, one at the top, the other at the bottom. I make sure to go ahead and label the back of the painting with title, number of authenticity and a personal note. A hanger and nail is taped to the hanging wire. An arrow is penciled in on the front of the canvas indicating the top so the labeling on the back is right side up. The cardboard is pressed down onto the screw eyes, making indentations. 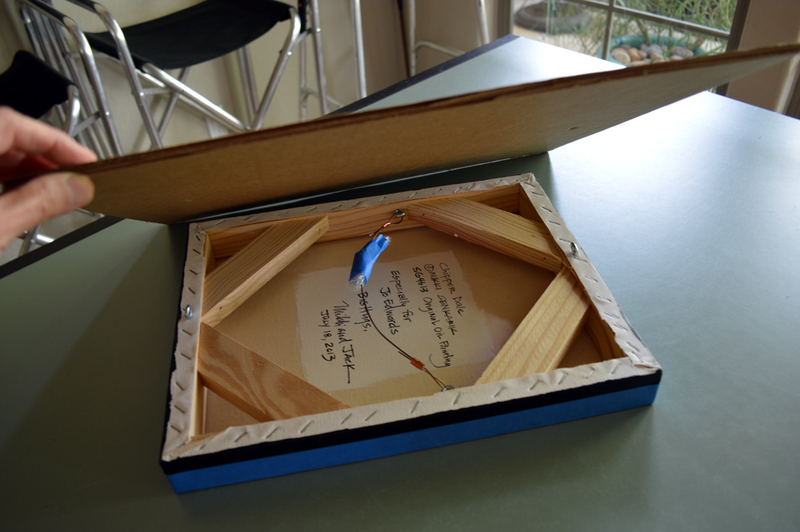 Using an ice pick holes are made so the screw eyes protrude up above the cardboard. Then nails are inserted through them to hold the canvas to the backing. This makes it easy to handle and ship the wet painting. 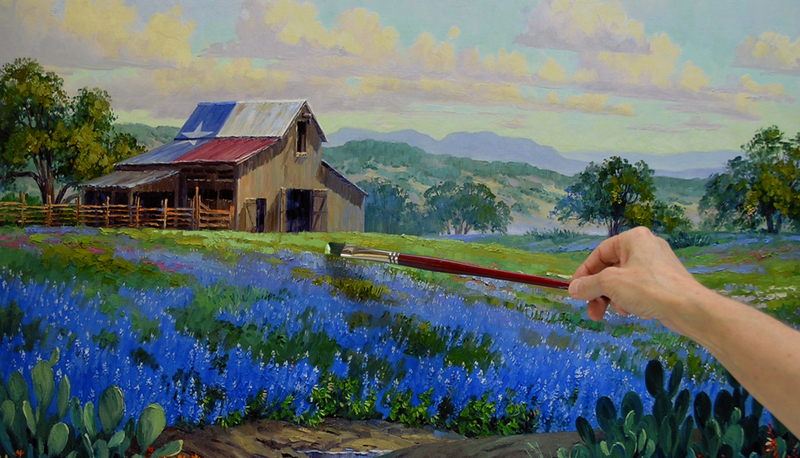 The background is painted with blues and greens. 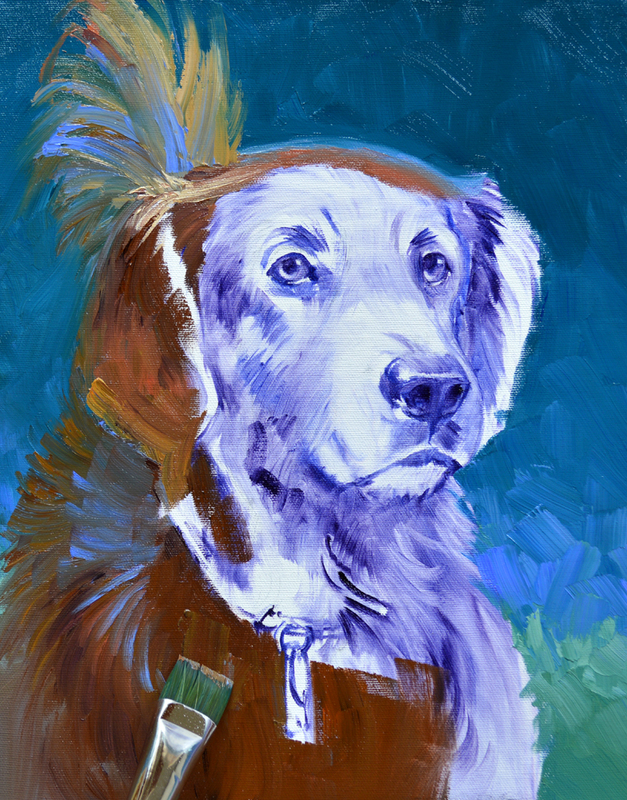 These cool colors will drop back when Chipper Dale’s warm, golden coat is painted. 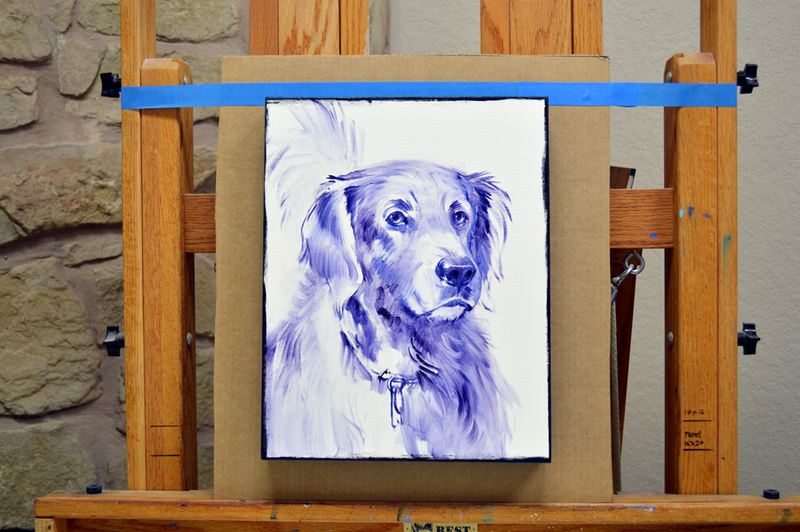 Various mixtures of Cadmium Orange + Ultramarine Blue + White are used for his fluffy coat. 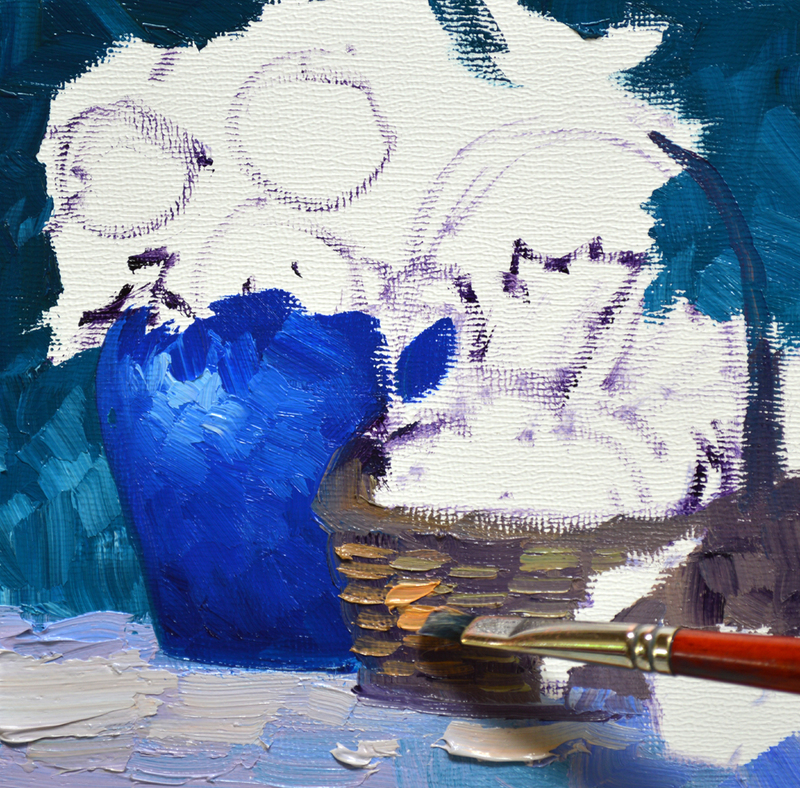 MUD (Ultramarine Blue + Alizarin Crimson) is added for the darker values. 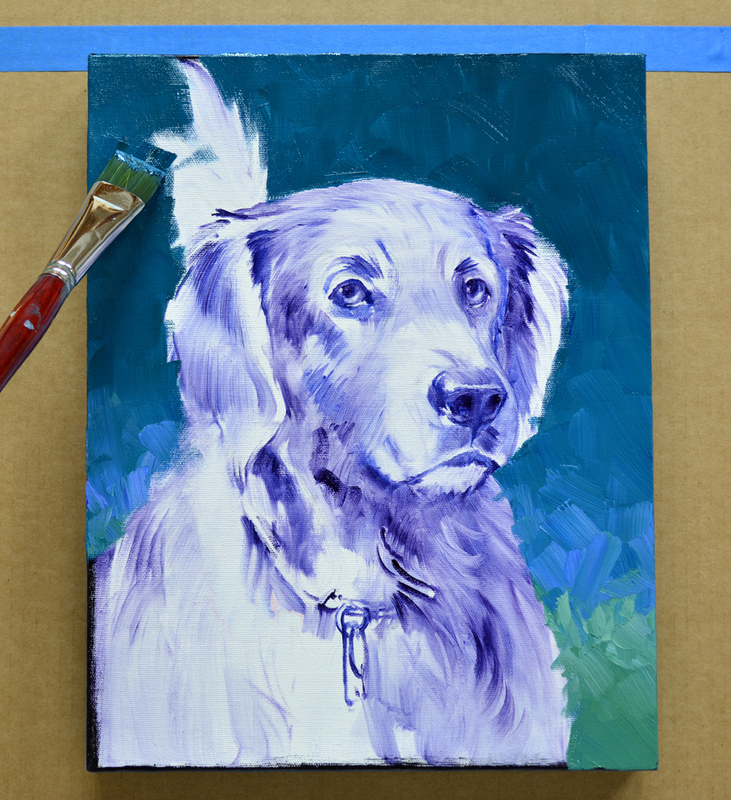 A bit of Cadmium Red Light is mixed in for the redder tones in Chipper’s coat. 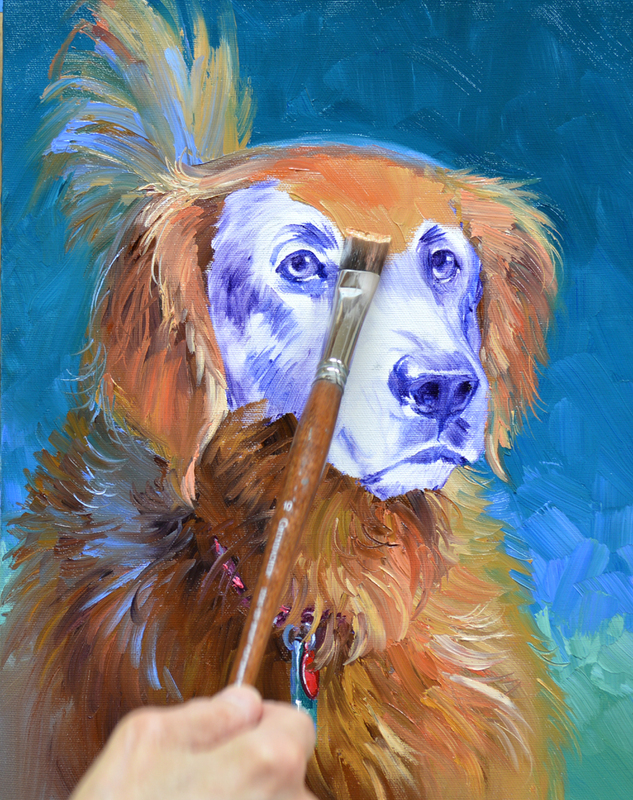 By working wet-into-wet over the background I can keep the fur on the edges of his body soft. Next the planes of the head are blocked in, then I’ll come back to add the detail, eyes and nose. For our auction on eBay this week I’ve designed two EMBRYOS that work as a pair. The two placed side-by-side make a complete courtyard scene overlooking the beautiful La Jolla coastline. I sketch them up together to make sure the composition flows from one piece to the other. 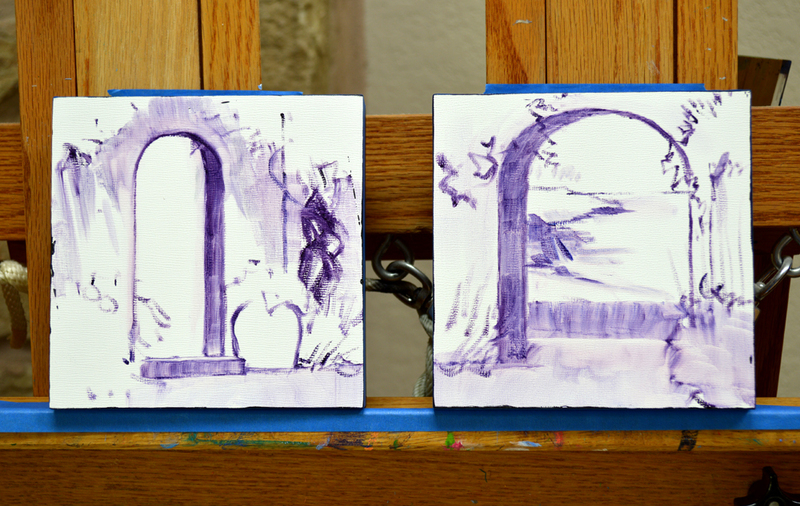 As in construction I “Build” the architectural elements of the painting first. The shadow and sunlight patterns on the wall are established, then the terra cotta tiles of the courtyard floor are laid. 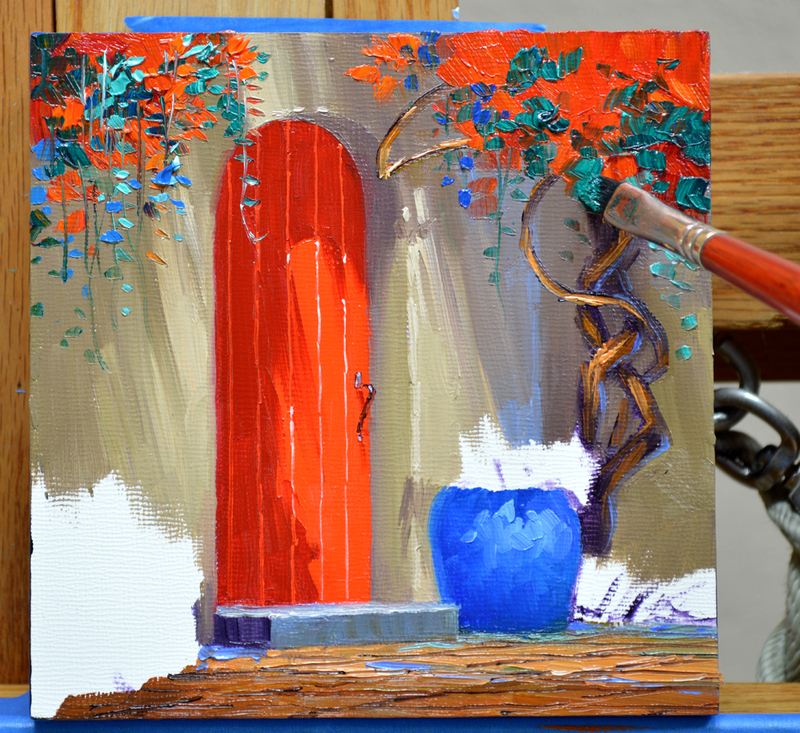 Now for the red door. 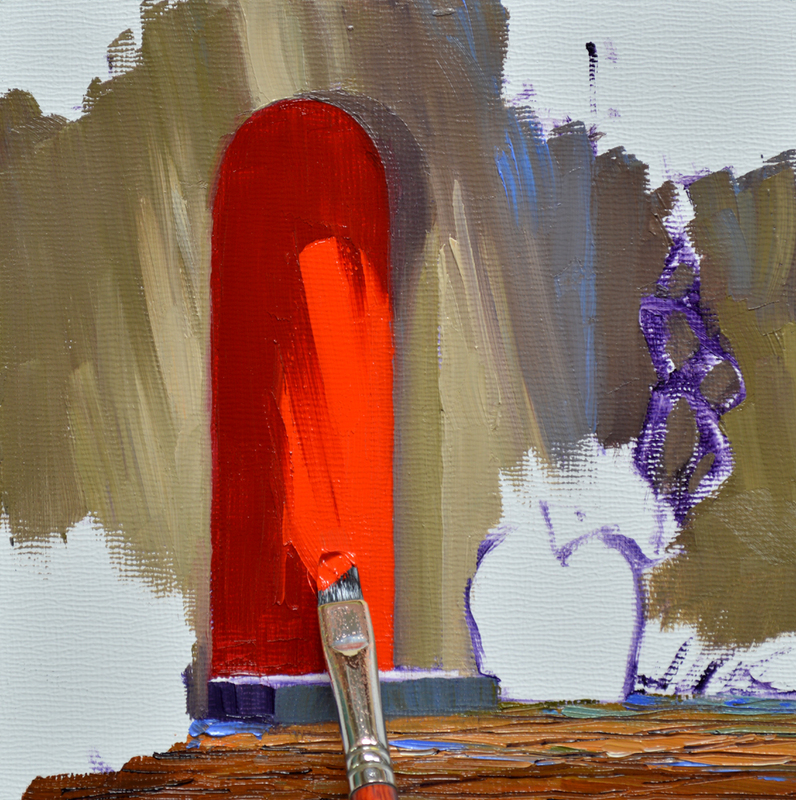 The shadow area is Cadmium Red Deep + Magenta, while the sunny portion is pure Cadmium Red Light. 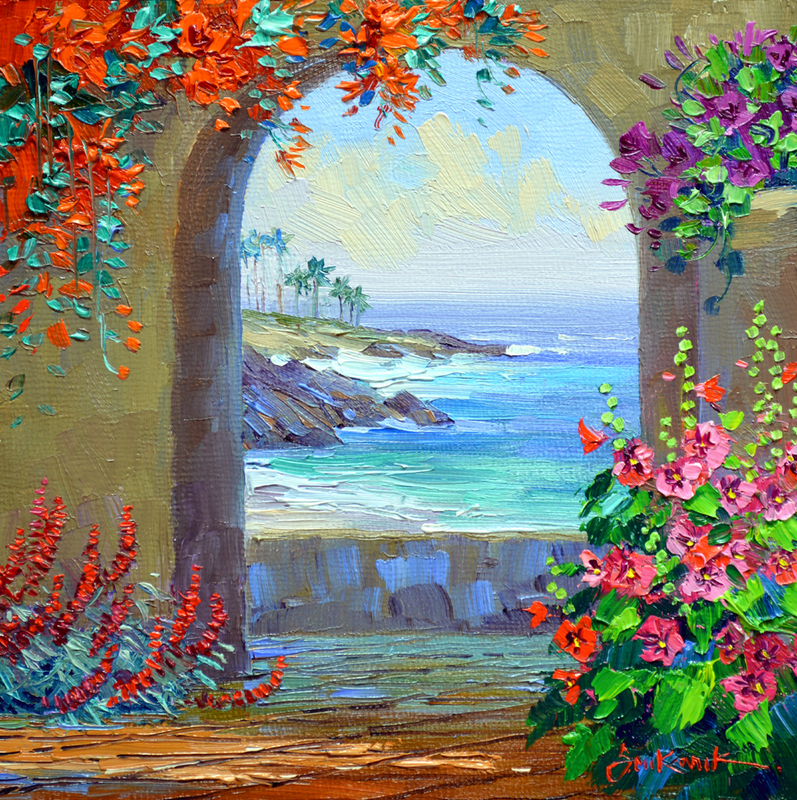 Bright red-orange Trumpet Vine drapes down, the long tendrils gently sway in the breeze coming in through the archway from the ocean below. Sunflowers fill the lower left corner. I go ahead and sign the piece in the foliage while it’s still wet. Moving to the deep blue ceramic container I plant White Petunias, painting them in my usual sequence of Flowers First, Leaves Last. 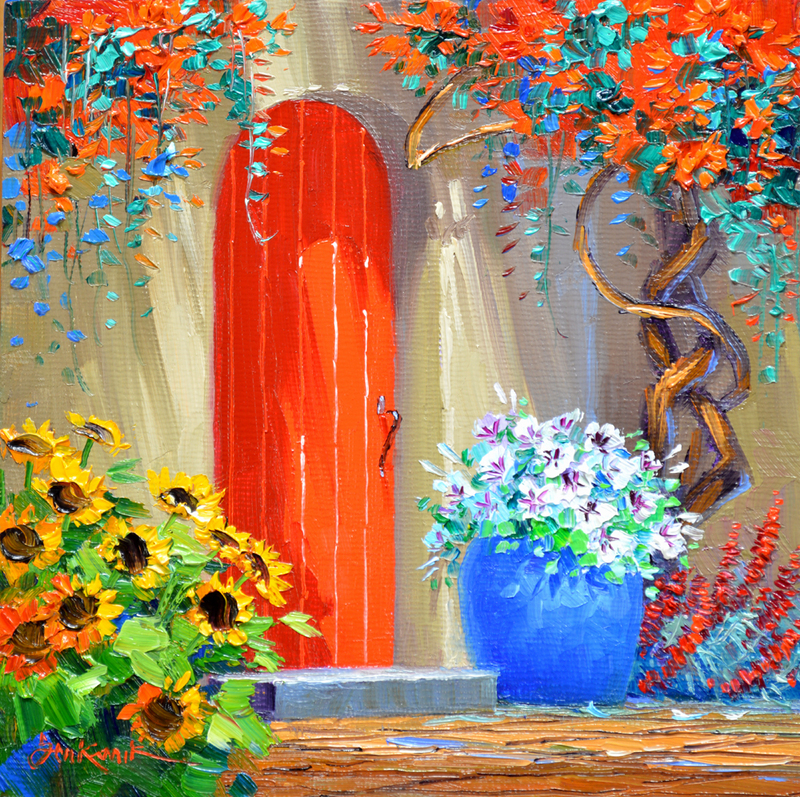 Nothing like a Red Door and Sunflowers to extend a warm greeting of welcome. And the White Petunias add a cheery exclamation point! 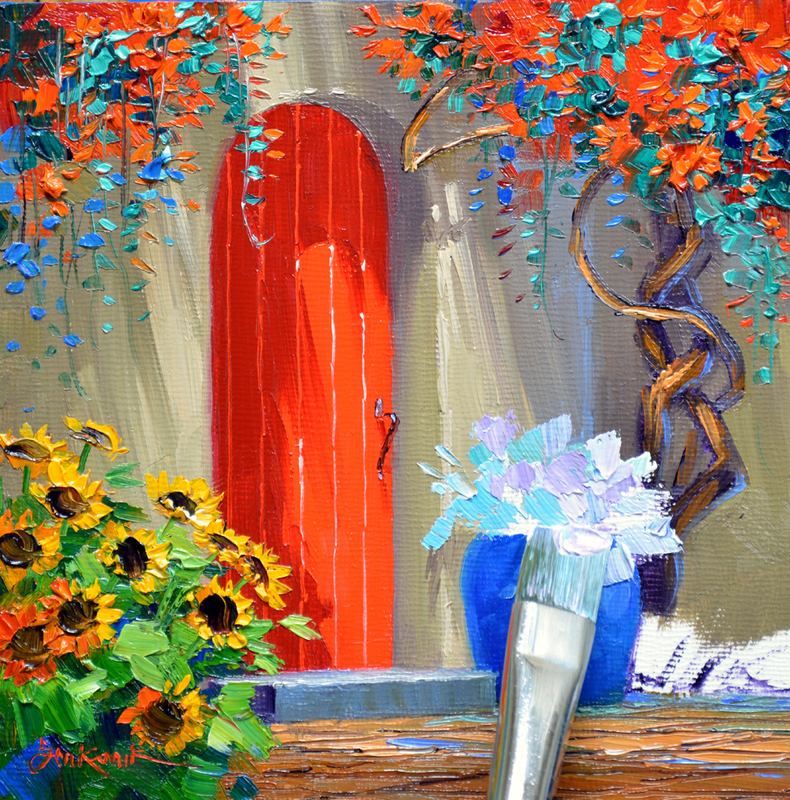 Let this colorful little piece bring you a surge of happiness every time you look at it on your wall. My EMBRYOS retail in our galleries for $300. However we are starting the bidding at 1 cent. That’s right, ONE PENNY! Radiant Red is one of two EMBRYOS designed to hang as a pair, but they can displayed individually. I’ve included a picture of the grouping. Wouldn’t you love to live here? 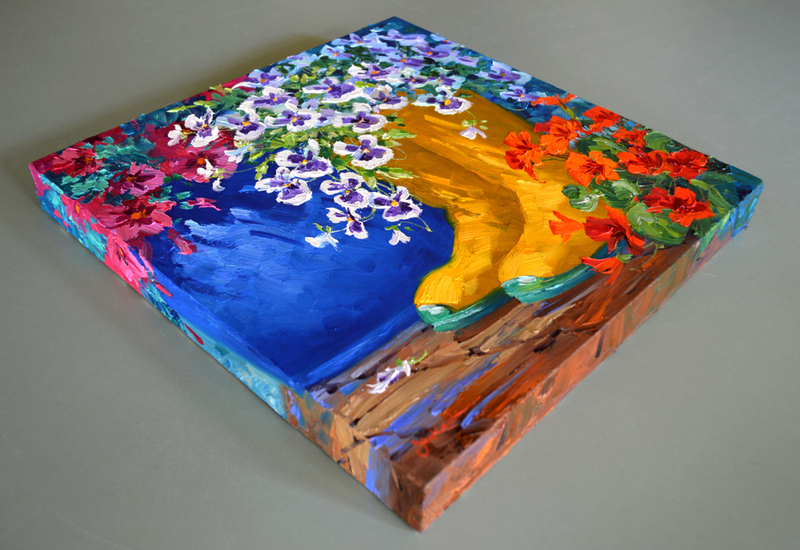 Bring the beauty of La Jolla to your home. 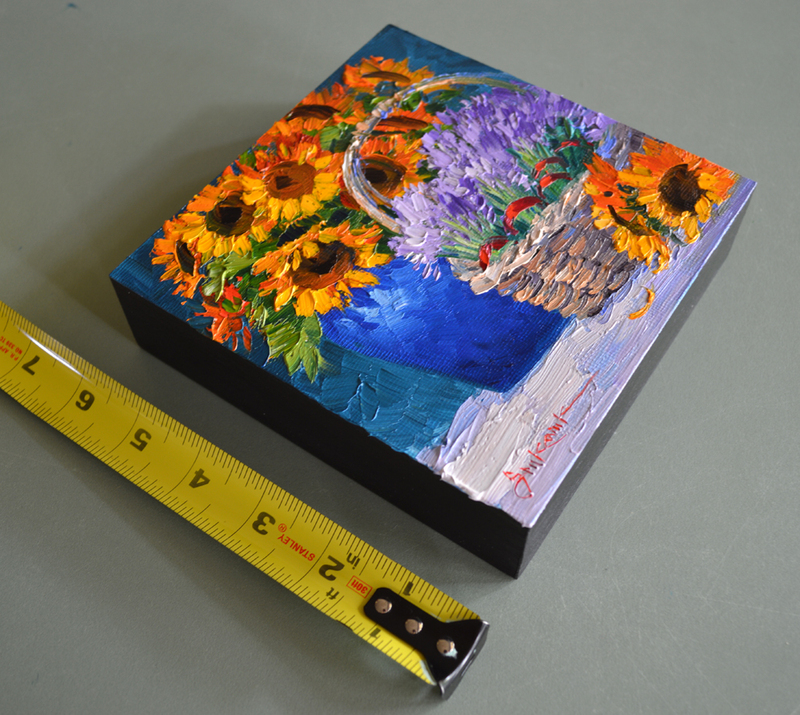 The auctions are staggered 7 minutes apart so you can win the two Original Oil Paintings to hang on your wall. AND…..If you win both pieces we will give you FREE SHIPPING! As you have probably figured out by now I love to garden. And my gardening boots take a beating, when a pair wears out we make them into planters. You can see the thought process on my idea for this piece in the sketches above. The first version on the left didn’t satisfy me, the boots were too much in the center. The second drawing on the right is much better. Just click on the image to see the pictures larger. 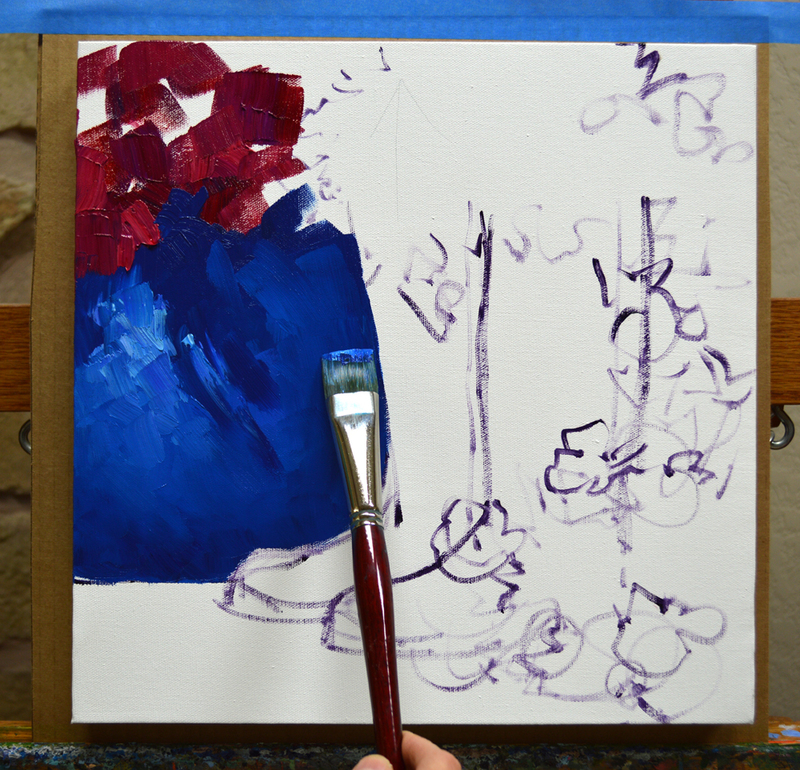 The initial idea is drawn up on the canvas with a brush dipped in a thin oil wash of MUD (Ultramarine Blue + Alizarin Crimson) + Liquin. Then the petunias and blue ceramic container are blocked in. 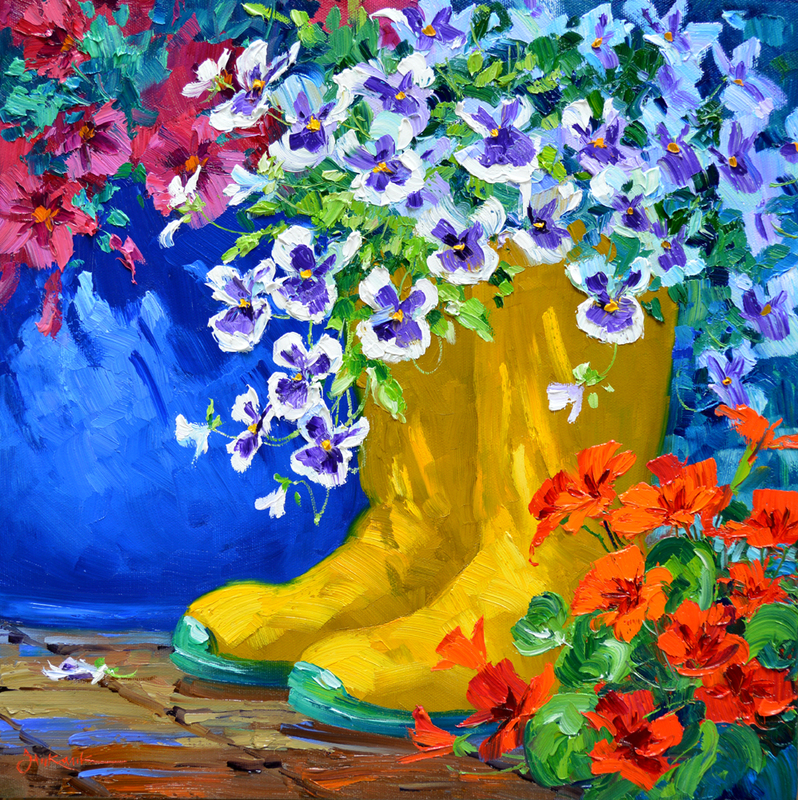 Now for my happy, yellow boots. 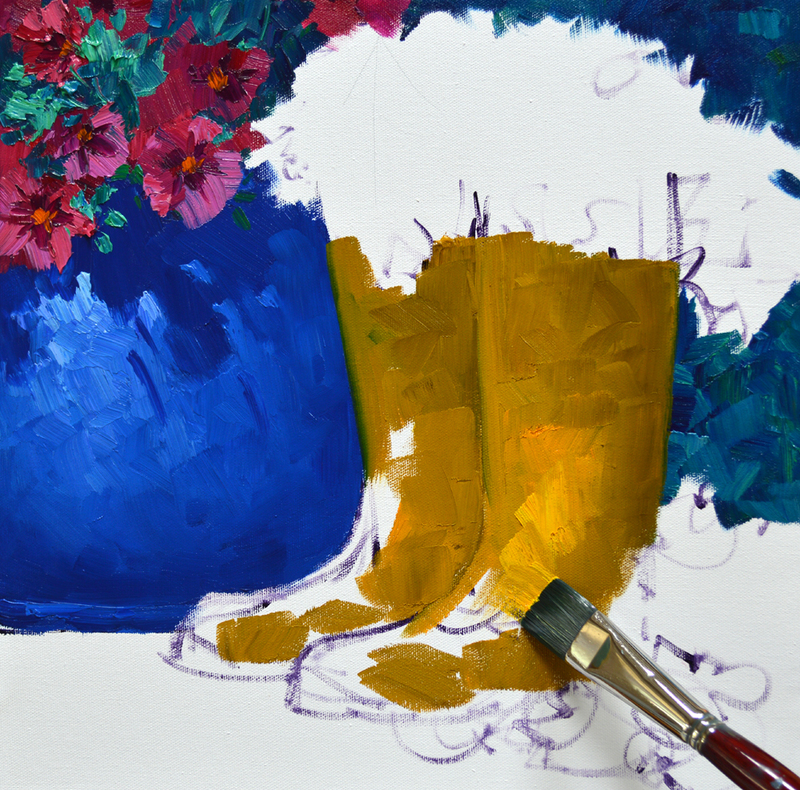 Various proportions of Cadmium Yellow Medium + MUD are used for the shadows, while pure Cadmium Yellow Medium makes the highlights. Rough pavers in the courtyard provide a nice contrast to the smooth pot and boots. Then Viridian Green + White is used for the soles of the boots. 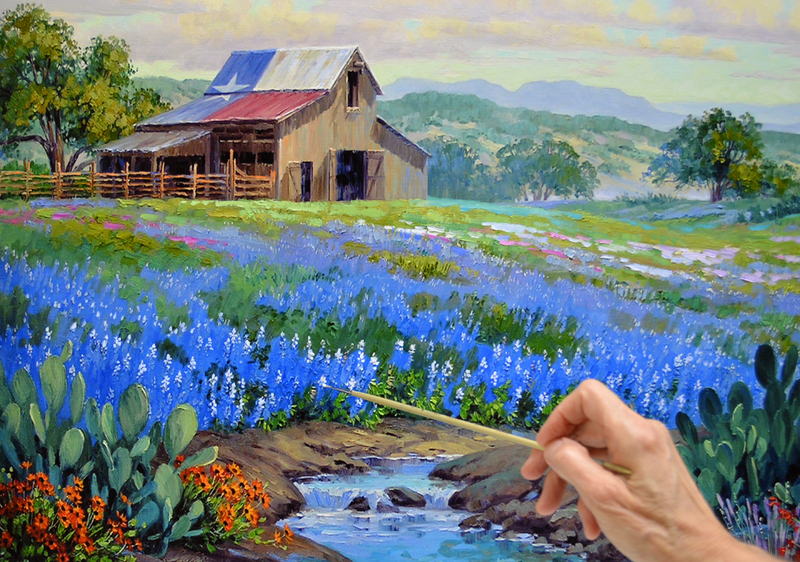 As I block in the flowers and background the design is painted over the edge, on to the sides. 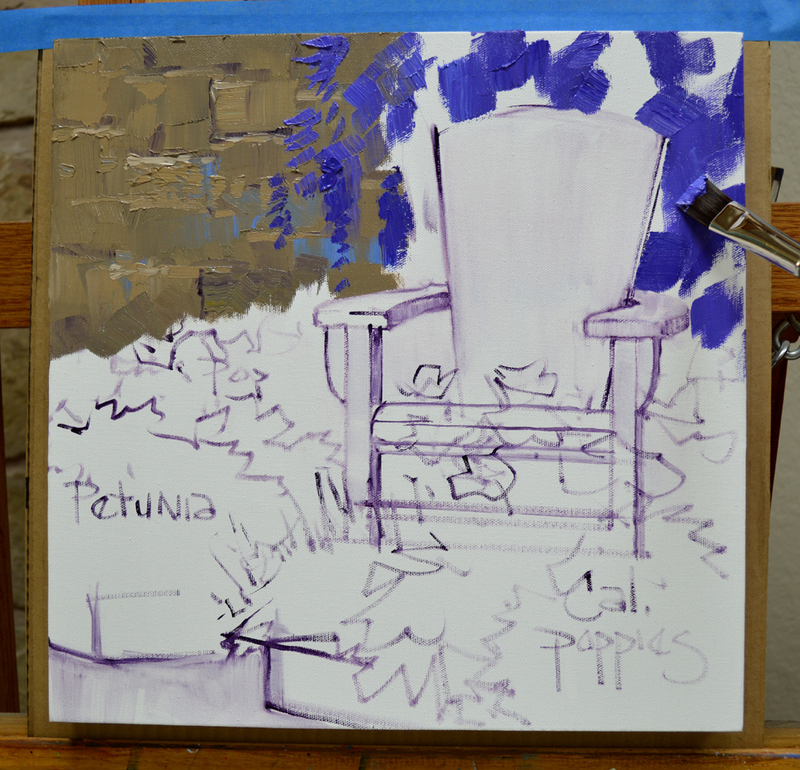 The Whites of the Pansies are painted first, then I add the purple “Faces”. 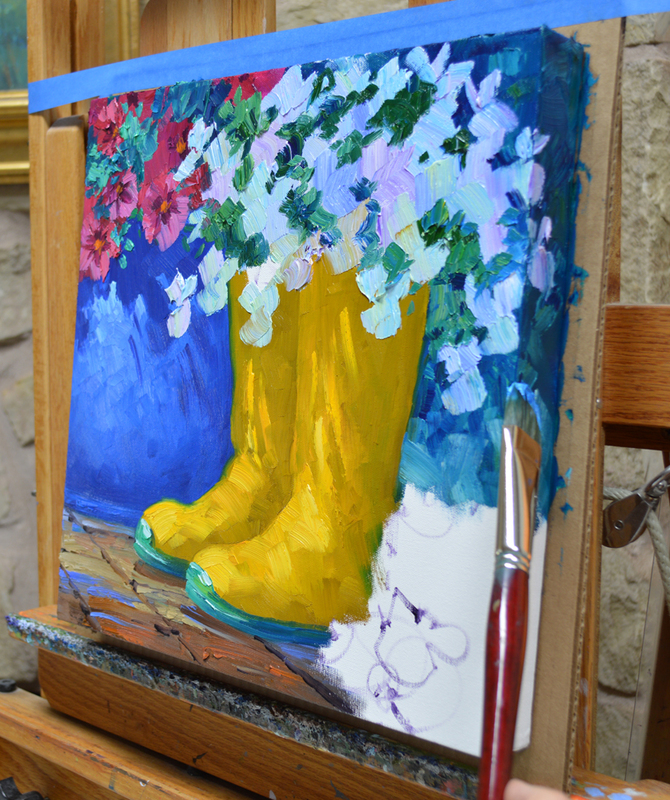 Every morning I work a bit in our garden and my rubber boots are constant companions. After many, many hours they become Old Friends. When they get too worn to wear we still enjoy their bright presence in our garden. Have you ever walked through a vineyard? It’s delightful as you saunter down the tunnel of leaves whispering in the breeze, your attention focused on the sunlit vignette framed by the vines at the end of the row. Let’s let a few lazy clouds drift across the Cobalt Blue sky. A small village of ancient stone buildings resides on the far side of the distant vineyard. 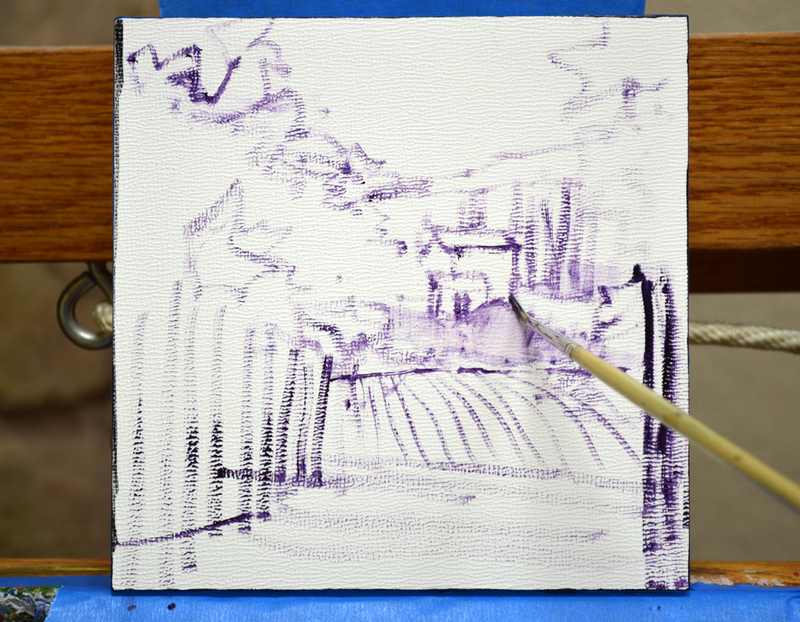 The entire field of vines is blocked in first, then I come back and draw the rows into the wet paint. And to walk through a vineyard in Tuscany with grapes that are ready to harvest is beyond wonderful. It’s such a temptation to reach out and grab a bunch. YUMMMMMM! Can’t you just taste those juicy grapes? 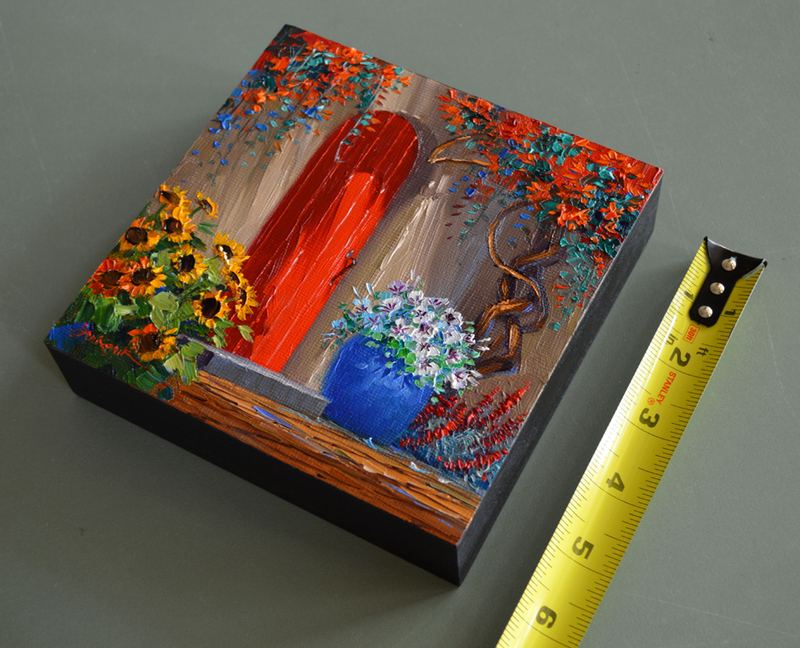 Magic of the Vines measures 6 inches by 6 inches. And don’t worry about doing any framing. My EMBRYOS have finished sides and are ready to hang on your wall. These would retail in our Team Senkarik Galleries for $300. Just to make it FUN we are starting the bidding at 1 Cent. That’s right, ONLY A PENNY. Magic of the Vines is one in a suite of four Tuscany EMBRYOS. 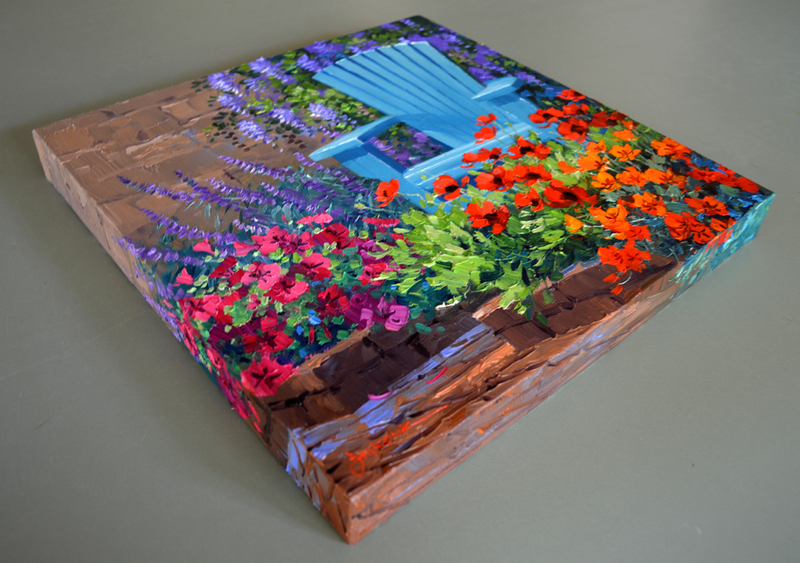 Bring the beauty of Tuscany to your home or office. 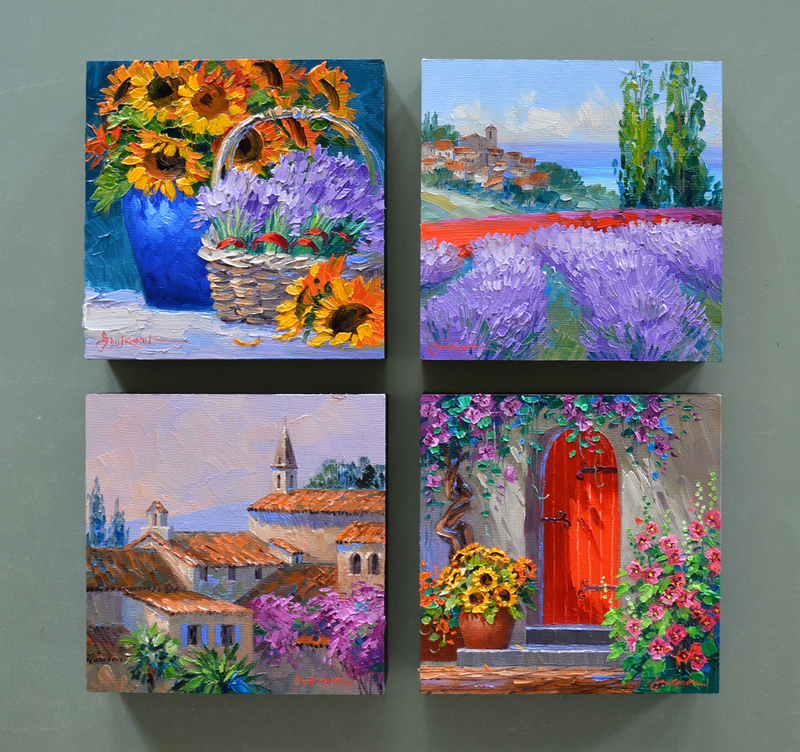 The auctions are staggered 7 minutes apart so you can win all four Original Oil Paintings to hang on your wall. AND…. if you win ALL FOUR we will give you FREE SHIPPING. BUT HURRY, the first auction ends Sunday evening at 8 PM Central Time! The other three pieces follow 7 minutes apart. 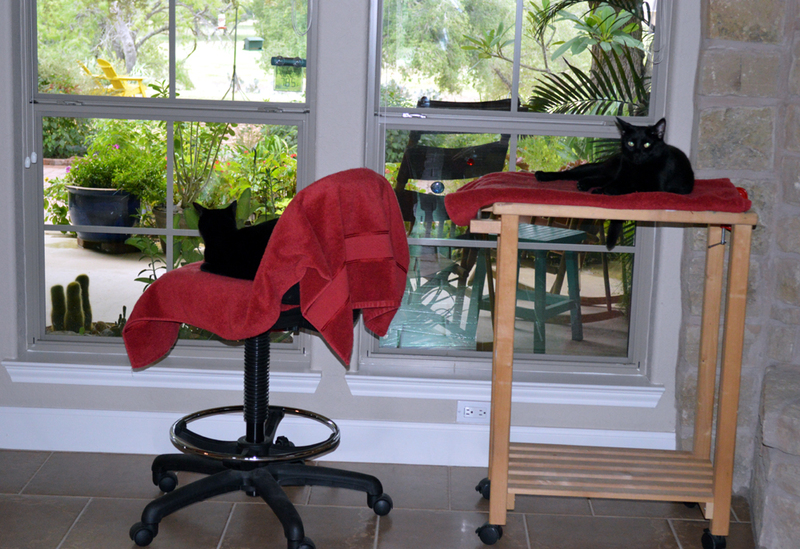 Sissie and Molly, our rescue kitties, are both supervising today. 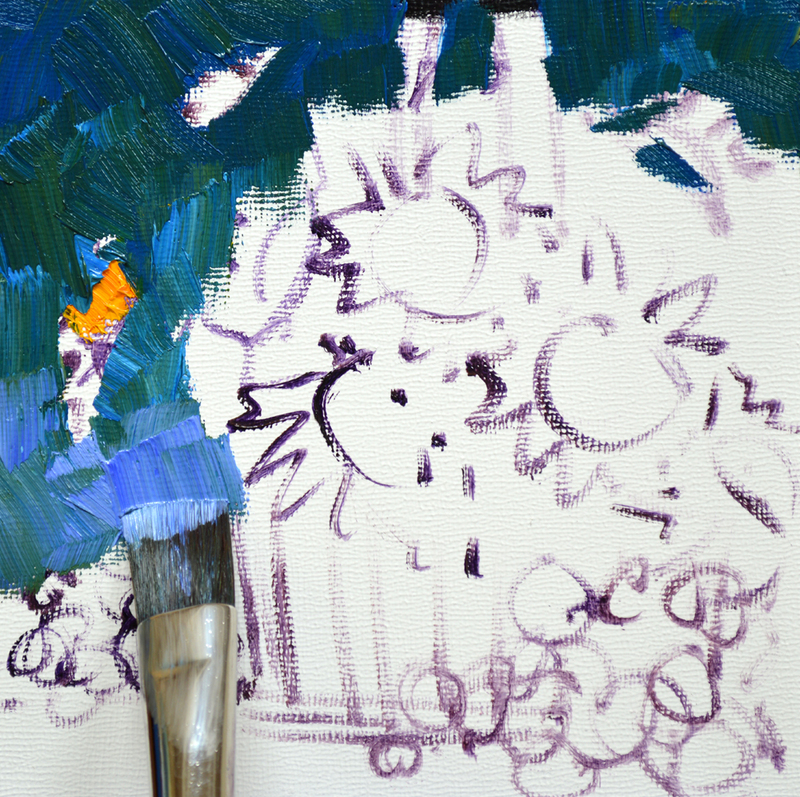 Although I think Sissie, on the chair, is more interested in watching the birds outside than me at the easel! Thought you’d like to see my easel setup. Our palette made of 1/4 inch glass on a white shelf board is placed on top of a culinary cart. The two shelves below are handy for keeping supplies close by. The toilet tissue is used for wiping my brush as I paint. The garbage bag is clipped to an aluminum walker which keeps it open and ready to throw the used tissue into. You can see my regular Oil Paints on the shelf. 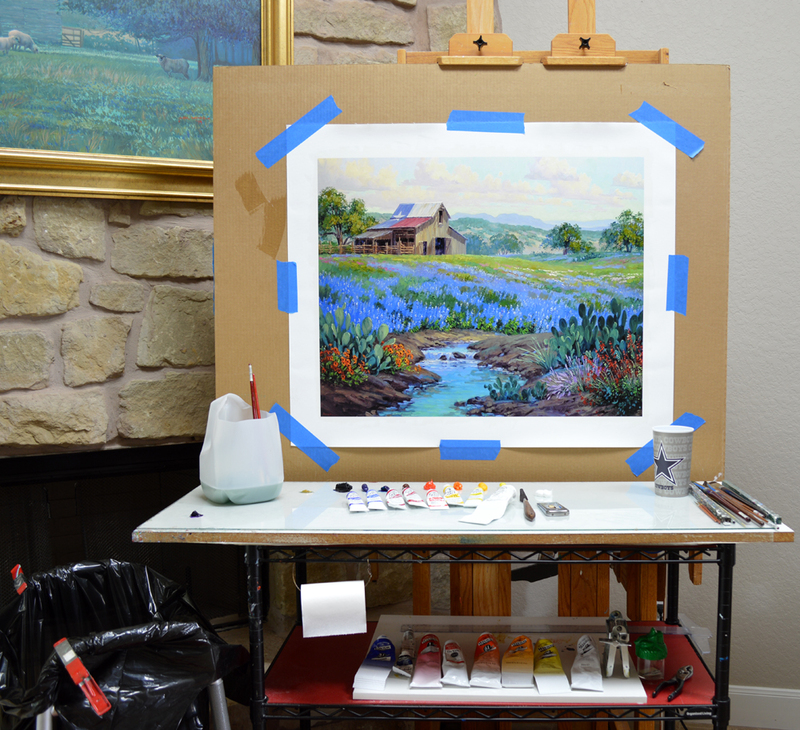 However, we use Alkyd Oil Paints for embellishing my giclees because they dry much faster than regular Oil Paint. The tubes of Alkyd Oil Paint are lined up on the palette. And what would I do without my Dallas Cowboys water cup? It’s almost football season, YIPPEE! If you’d like to see any of these pictures larger just click on the image. 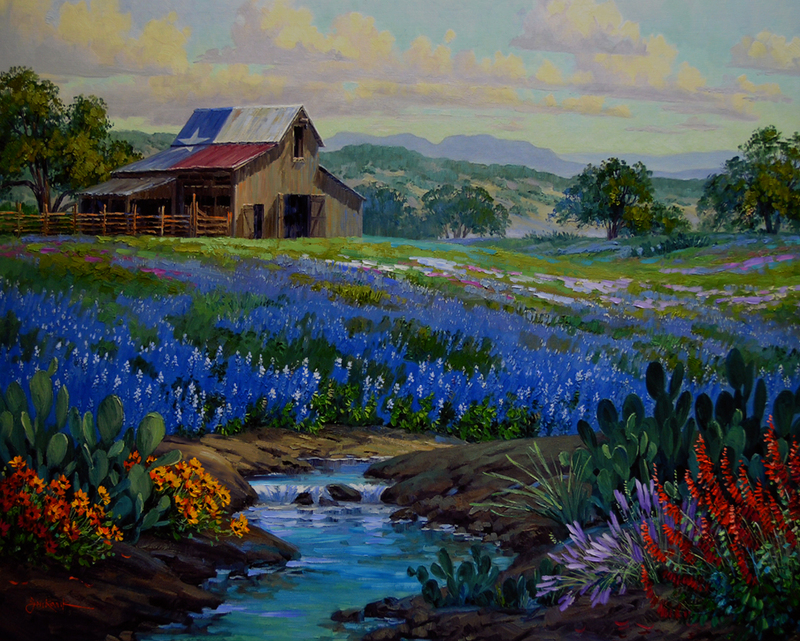 The unembellished giclee of The Glory Never Fades was shown in the previous picture. 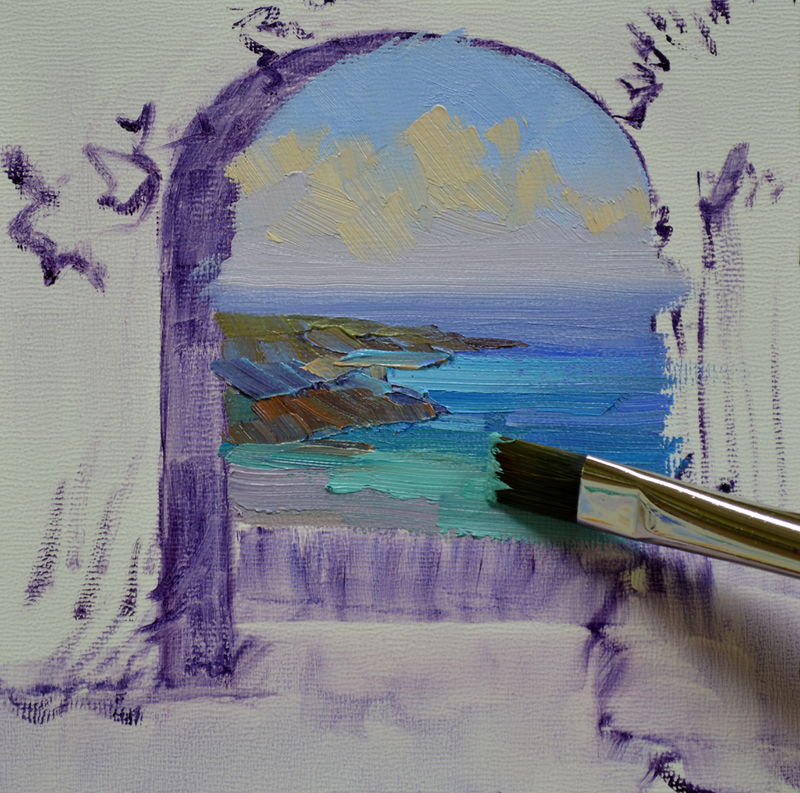 In the photo above I’ve glazed the blue of the sky with a thin oil wash of Ultramarine Blue + Liquin. You can see where I got some of the wash onto the white border at the top. Highlights are added on the old cedar fence, then I begin painting the barn. Sunshine illuminates the meadow in front of the barn. I go back in to highlight the cool green grass and wildflowers. 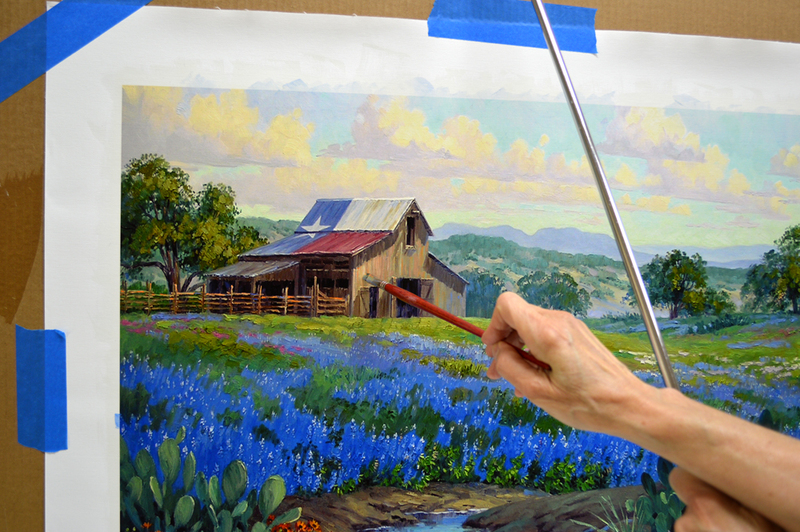 The bluebonnets have been glazed with Cobalt Blue + Liquin. Then the white tops, or bonnets, are added to the flowers in the foreground. Glistening white highlights have been made on the water as it tumbles over the rocks. Next the Yellow Coreopsis are completely repainted. I dreamed about this idea a few nights ago. 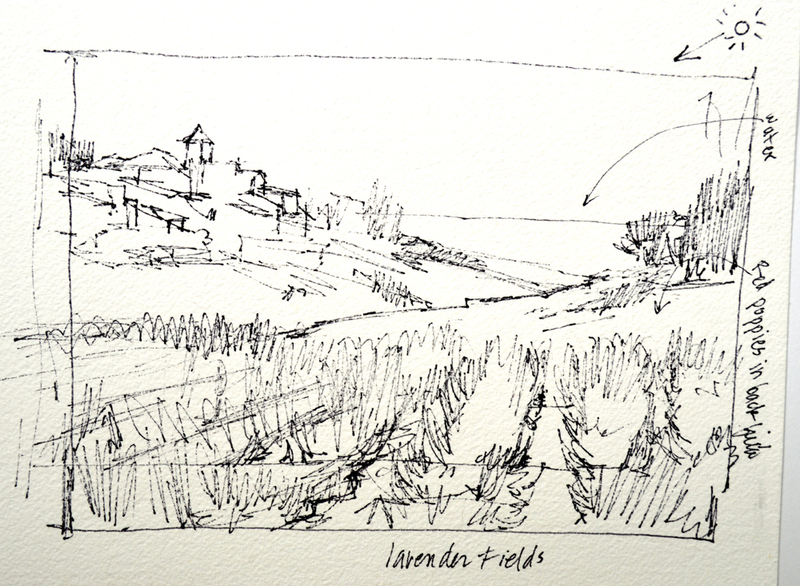 When I got up I made a quick pen and ink thumbnail sketch to nail the composition down. After drawing up the basic plan in an oil wash I begin blocking in the background. If you’d like to enlarge any of these images just CLICK on the picture. A mass of rich yellows, golds and oranges is painted in for the blossoms, then I go back and begin putting in the green leaves. 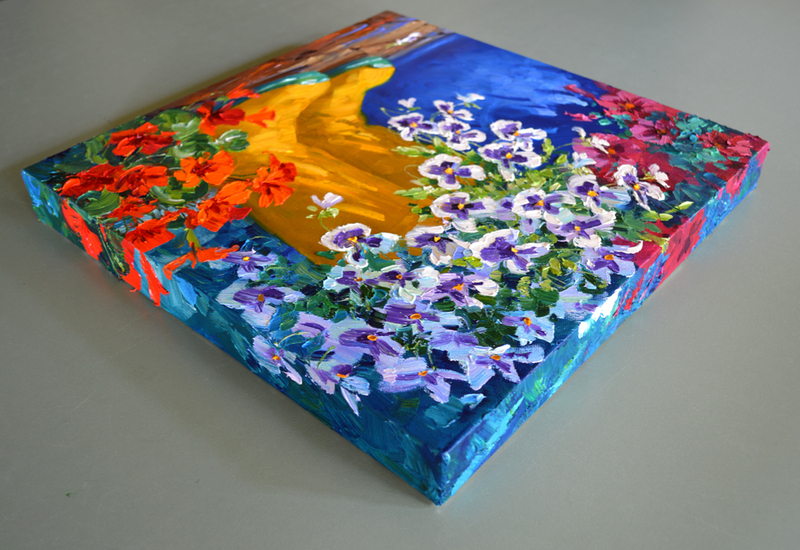 The foliage is worked around the flower color and helps to shape them. Painting the 6″ x 6″ EMBRYOS is so much fun. 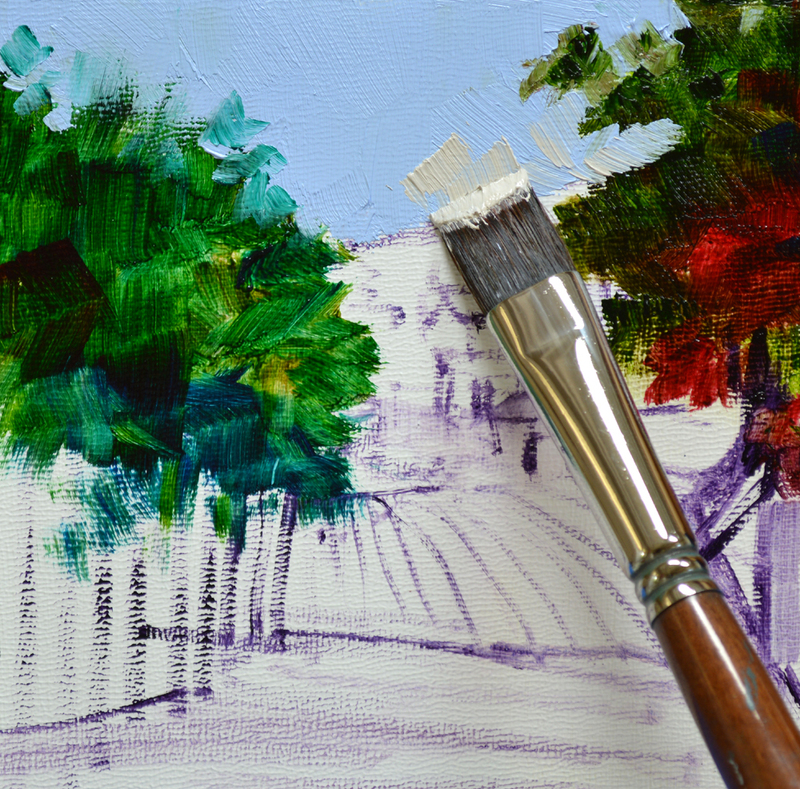 I work with as large a brush as possible and love the thick, juicy brushstrokes that result. 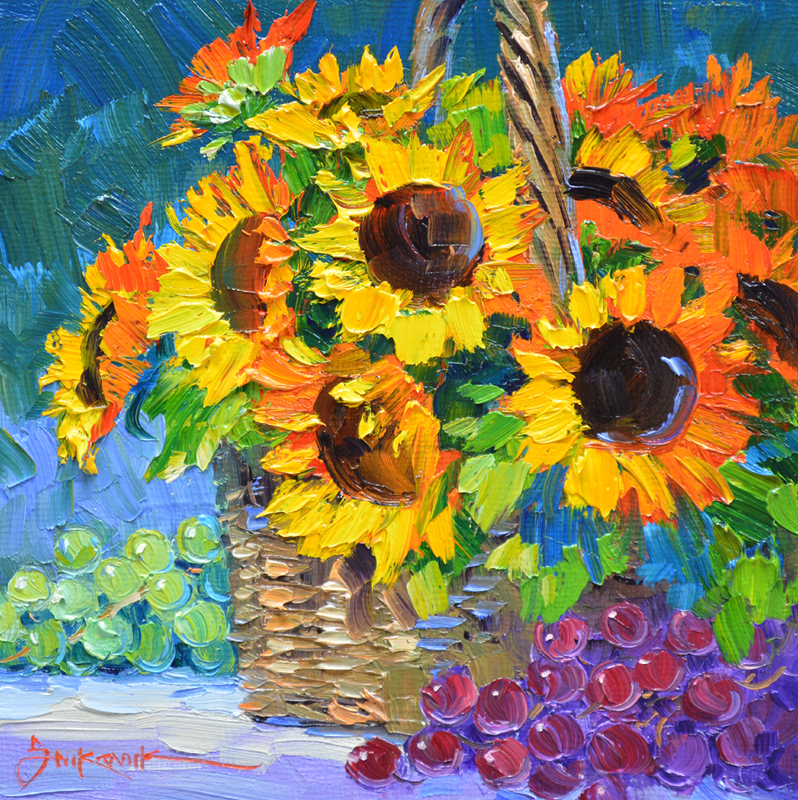 Grapes and Sunflowers are synonymous with Tuscany. Don’t you think they make a wonderful combination? To go to the auction CLICK HERE. 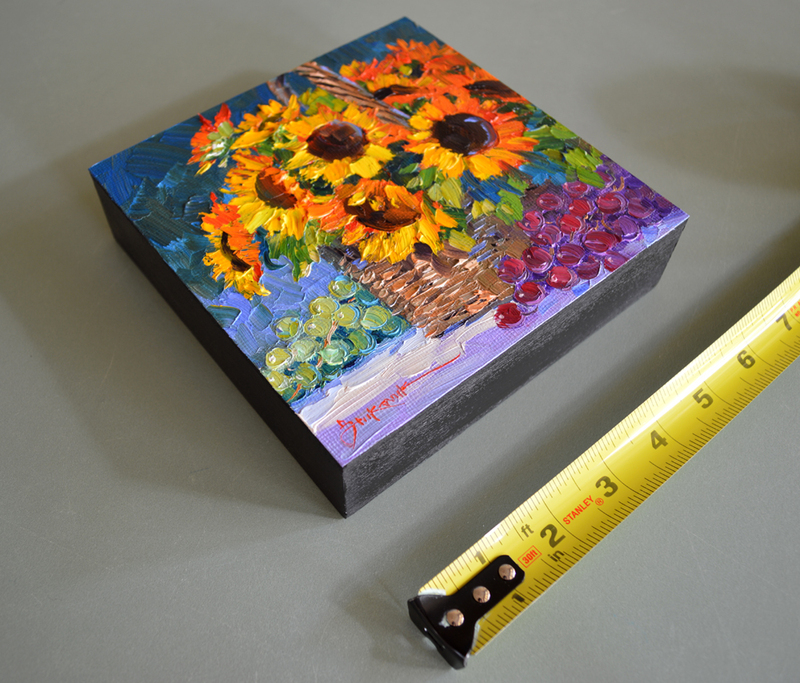 Bountiful Harvest measures 6 inches by 6 inches. And don’t worry about doing any framing. My EMBRYOS have finished sides and are ready to hang on your wall. These would retail in our Team Senkarik Galleries for $300. Just to make it FUN we are starting the bidding at 1 Cent. That’s right, ONLY A PENNY. Bountiful Harvest is one in a suite of four Tuscany EMBRYOS. 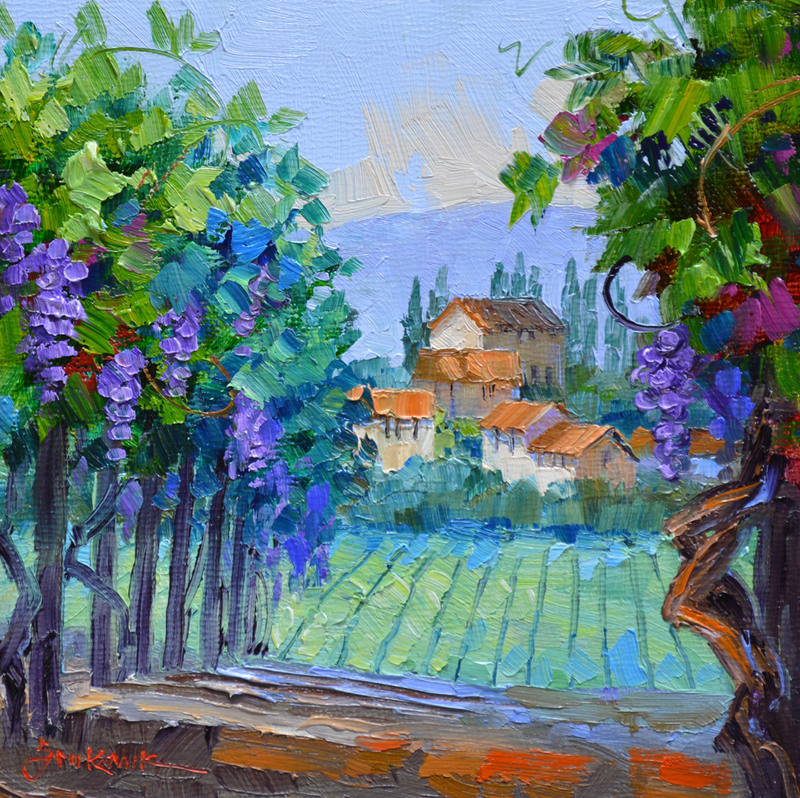 Bring the beauty of Tuscany to your home or office. 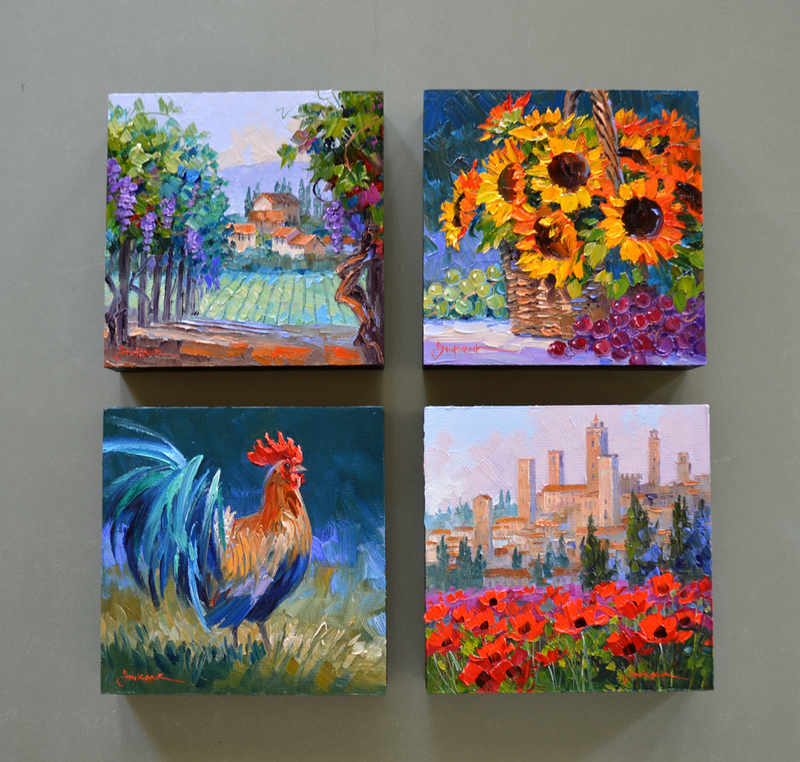 The auctions are staggered 7 minutes apart so you can win all four Original Oil Paintings to hang on your wall. AND…. if you win ALL FOUR we will give you FREE SHIPPING.